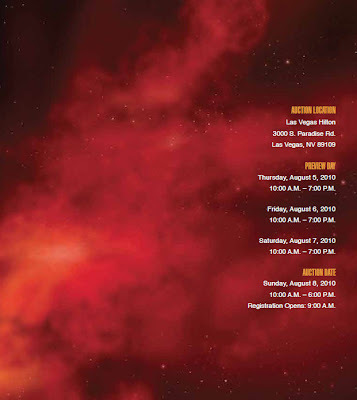 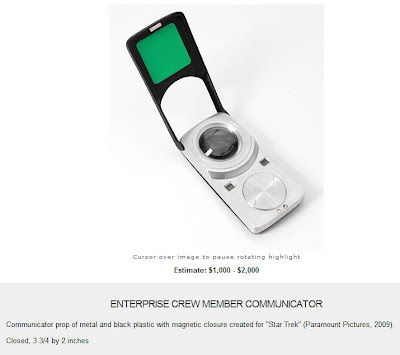 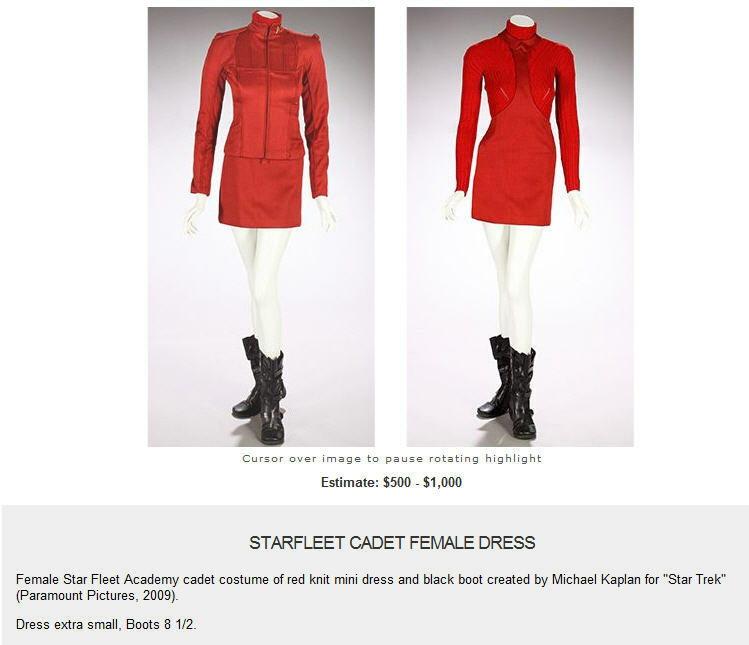 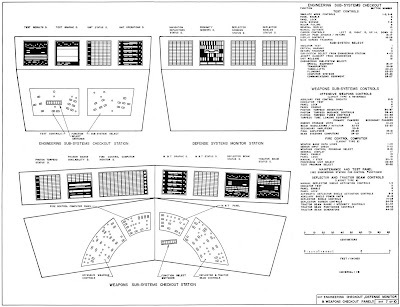 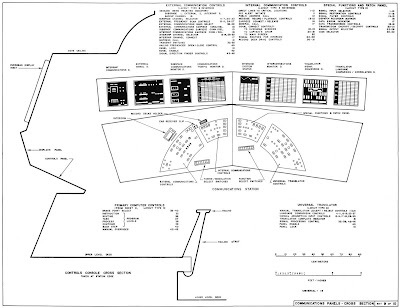 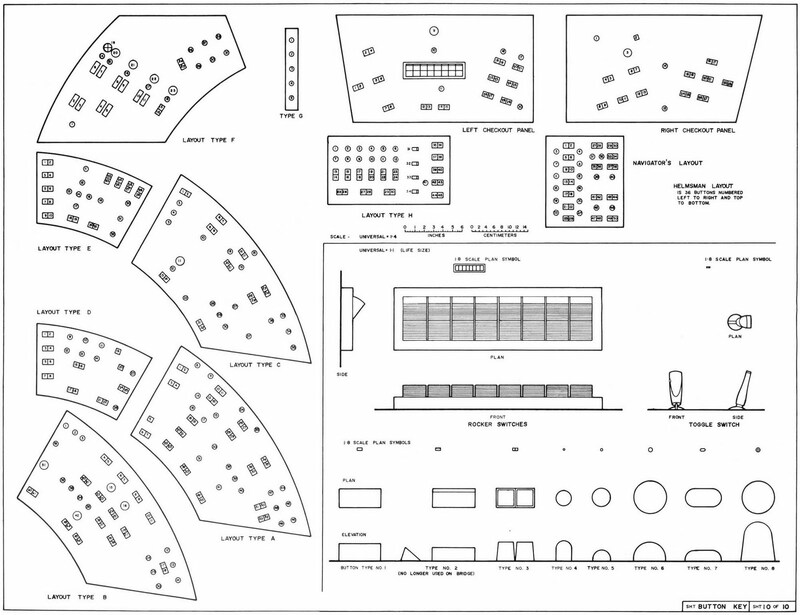 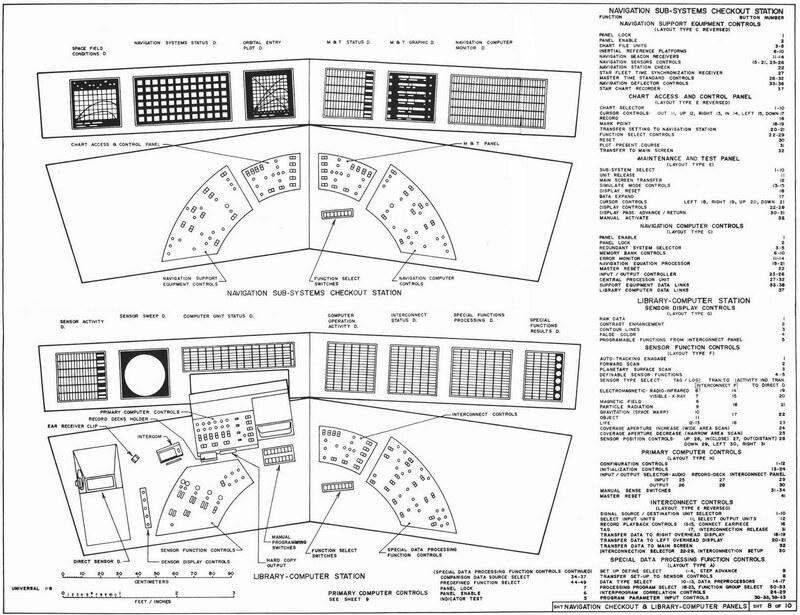 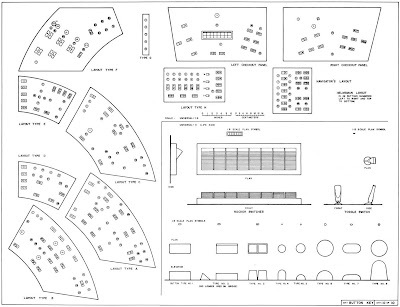 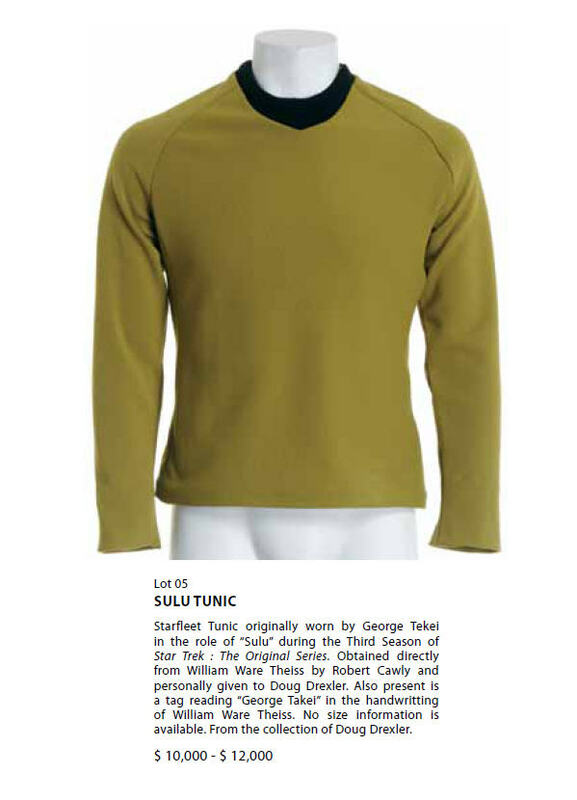 On June 27th, 2010, the Julien's Star Trek Auction (http://www.juliensauctions.com) will take place at the Planet Hollywood Resort and Casino in Las Vegas, Nevada. 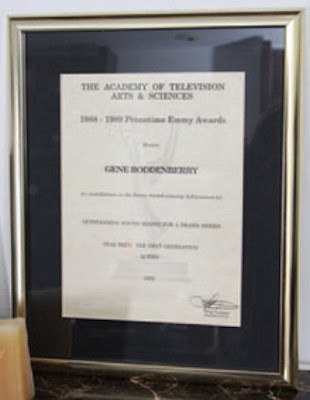 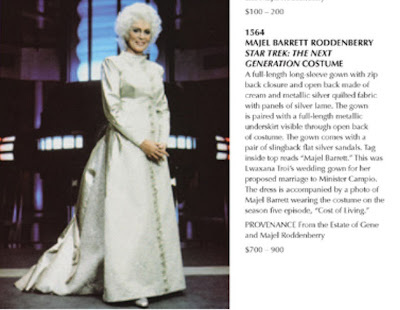 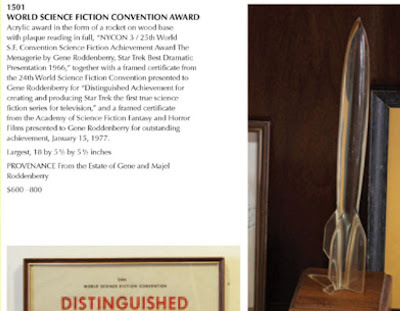 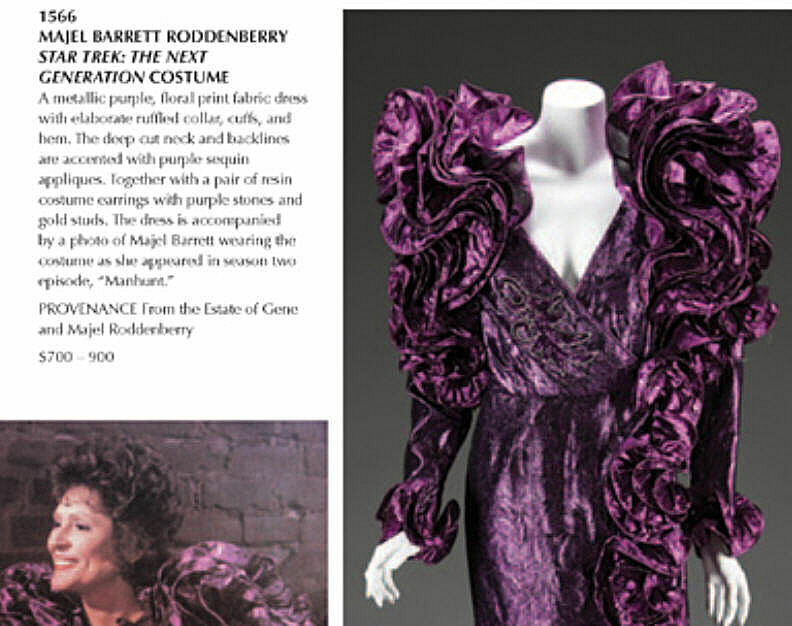 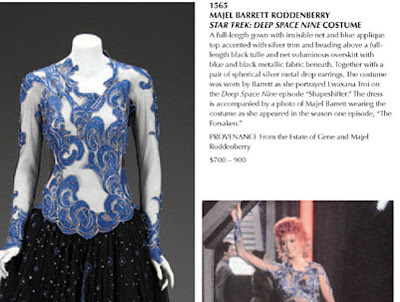 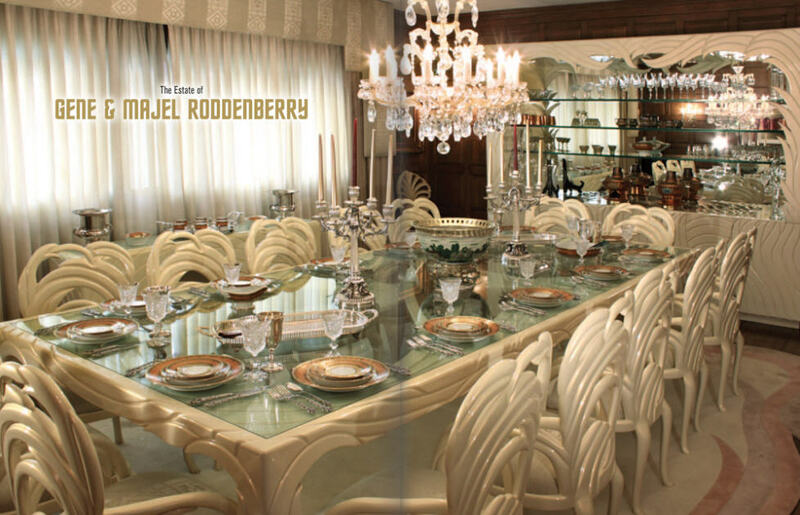 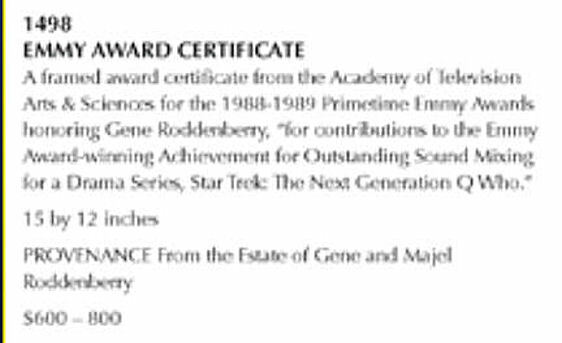 The prime focus of the event will be the sale of a large number of personal effects, home furnishings, memorabilia, books and artwork from the Estate of Gene and Majel Roddenberry. 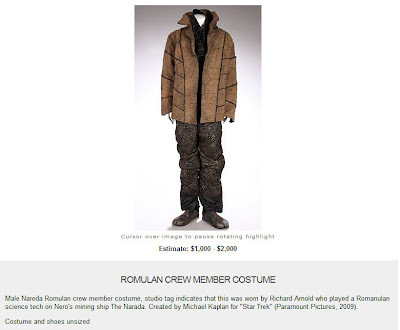 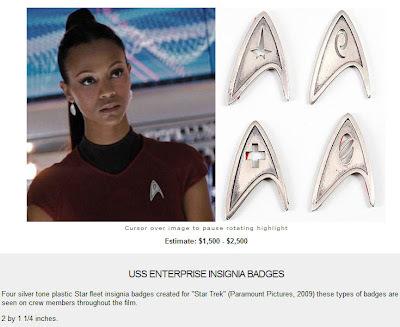 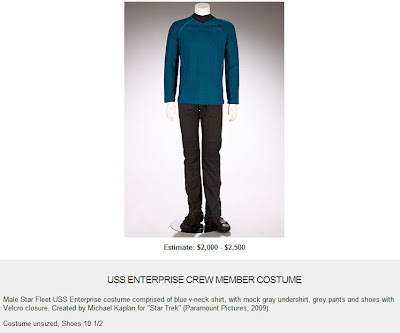 Of particular interest to Star Trek prop and wardrobe collectors will be the offering of a special consignment of 17 different screen used lots from the J.J. Abrams directed film Star Trek (Paramount, 2009). 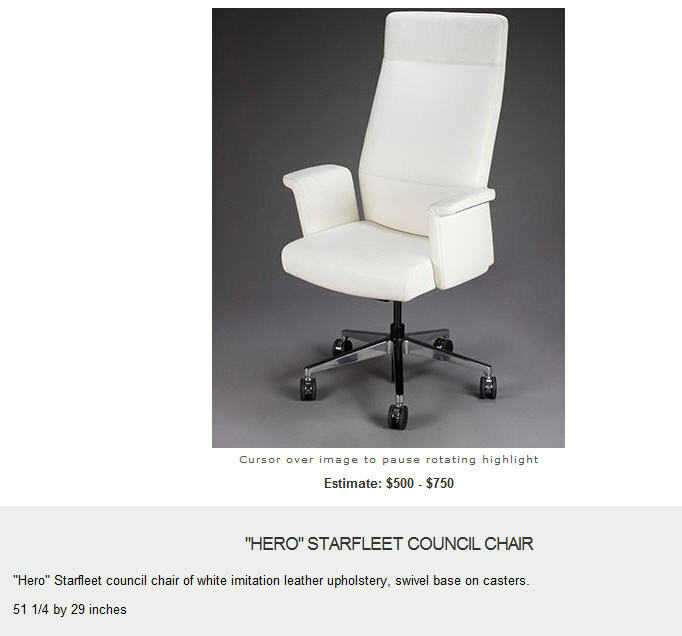 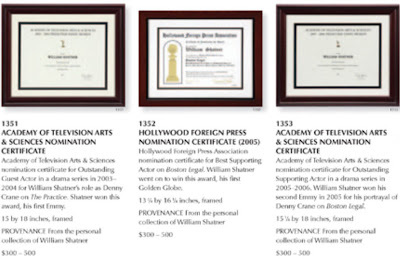 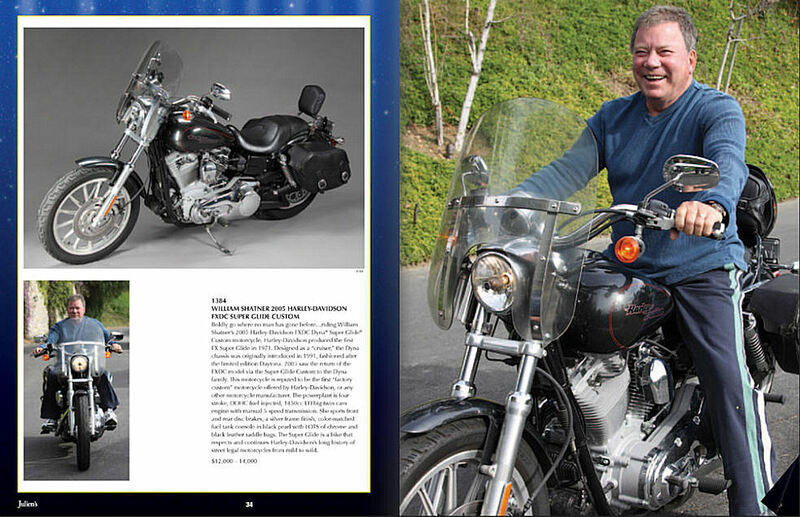 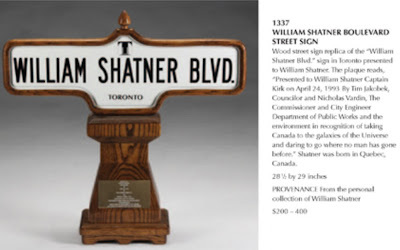 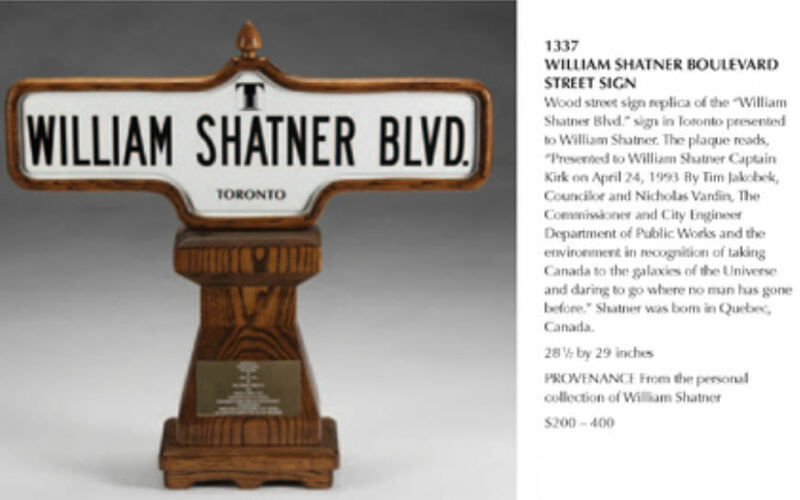 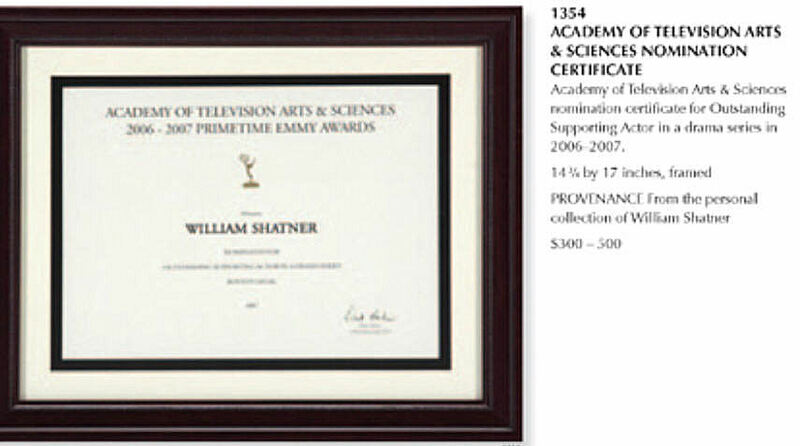 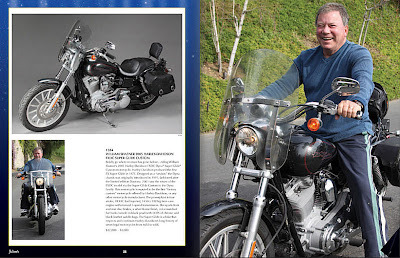 William Shatner has also consigned a selection of personal property from his career to this sale. 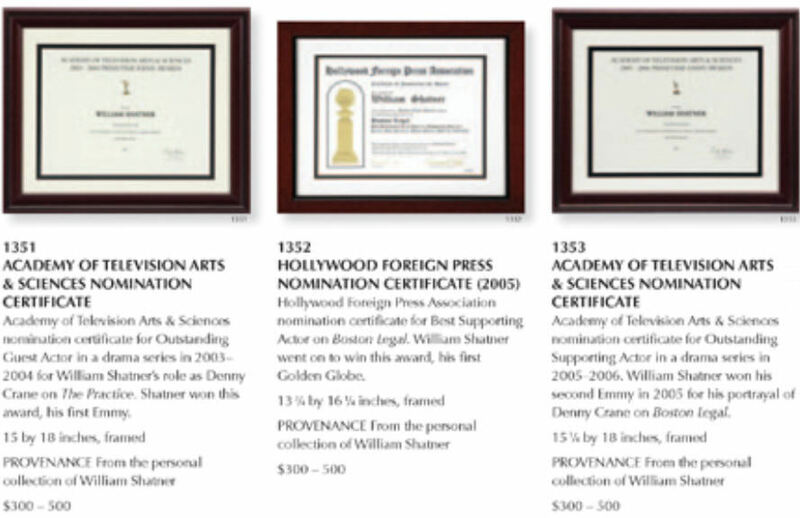 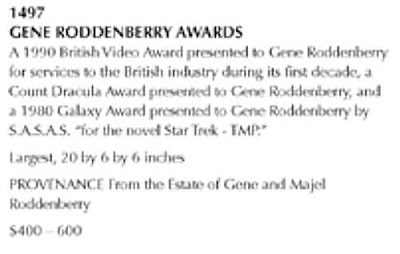 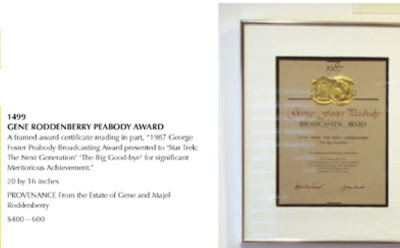 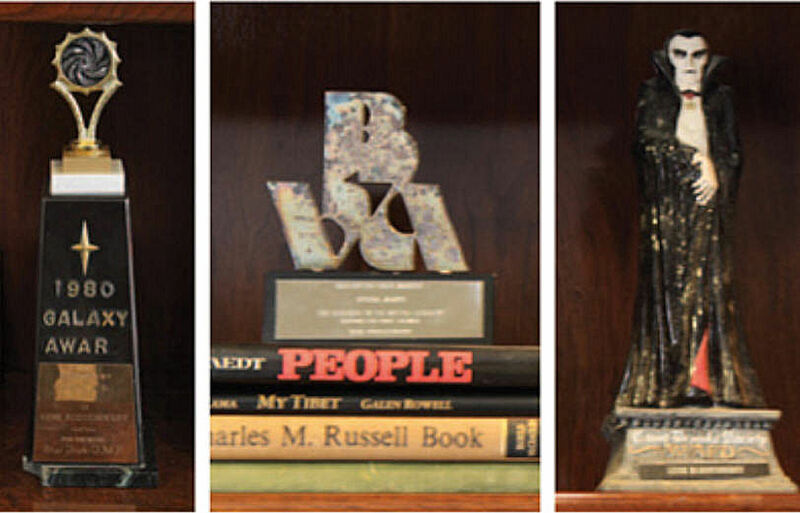 All proceeds from the auction of the Roddenberry estate items will be donated to charity and a portion of the sale of the Shatner memorabilia will benefit "The Hollywood Horse Show" charitable foundation. 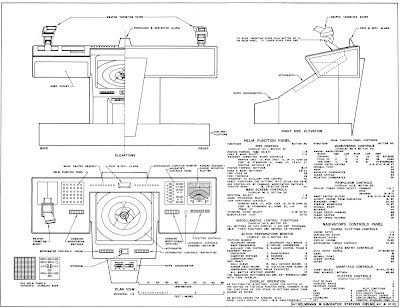 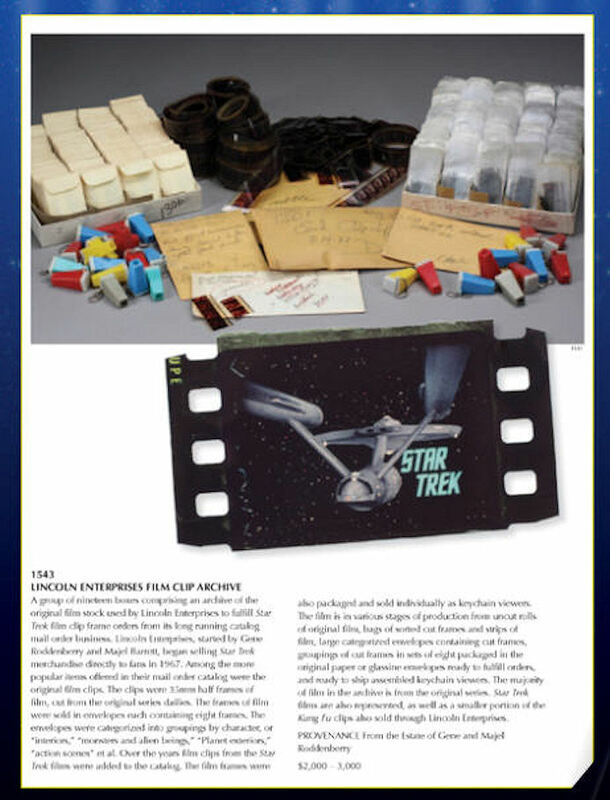 This summer's entertainment memorabilia auction season will long be remembered as one of the greatest for outstanding Star Trek memorabilia offerings; as the California-based auction house Propworx (http://www.propworx.com) just released a PDF version of its Star Trek auction catalog for the upcoming August 8th, 2010 sale to be held during the annual Official Star Trek Convention at the Las Vegas Hilton. Quite simply - this is the most artistically beautiful Star Trek auction catalog ever produced and offers collectors a spectacular array of exciting memorabilia! 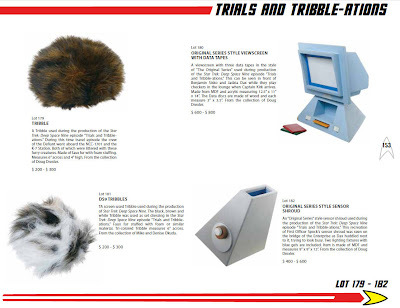 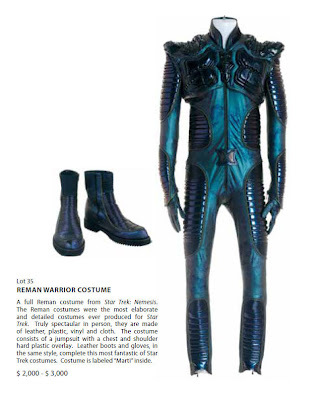 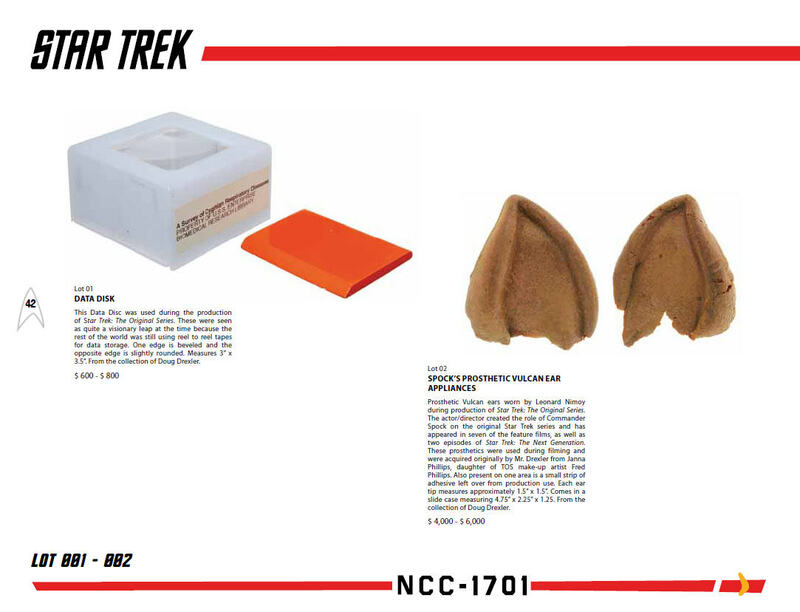 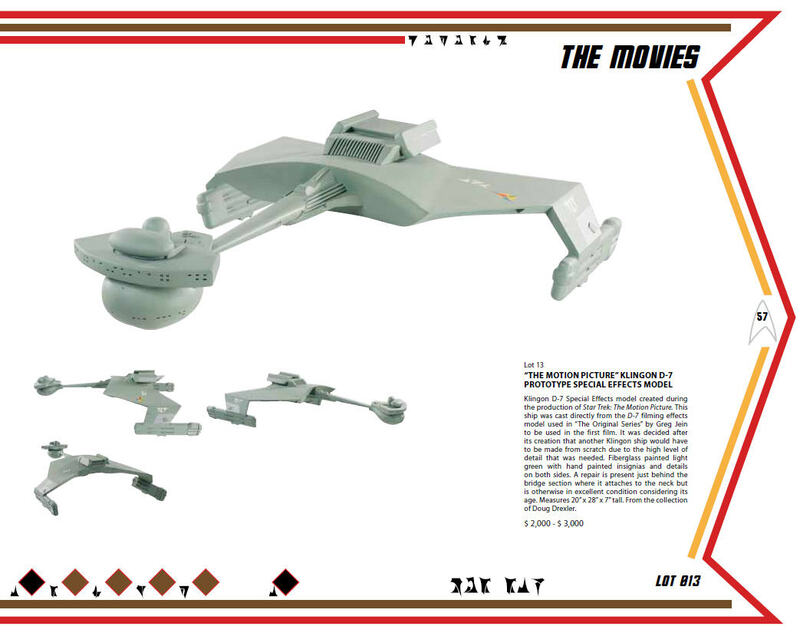 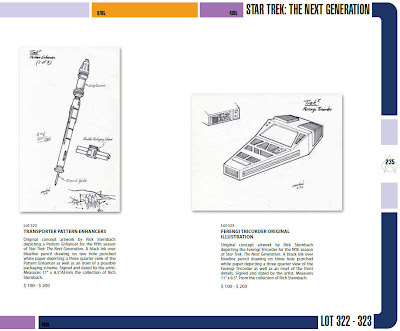 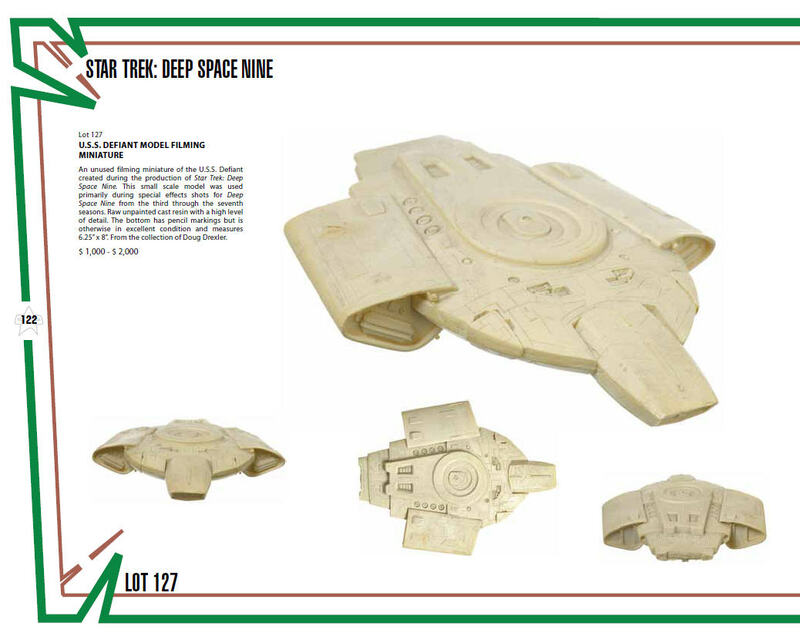 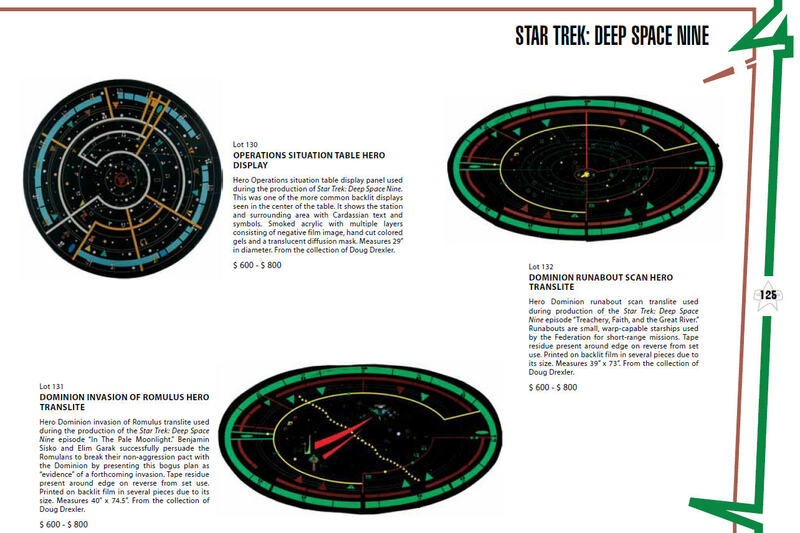 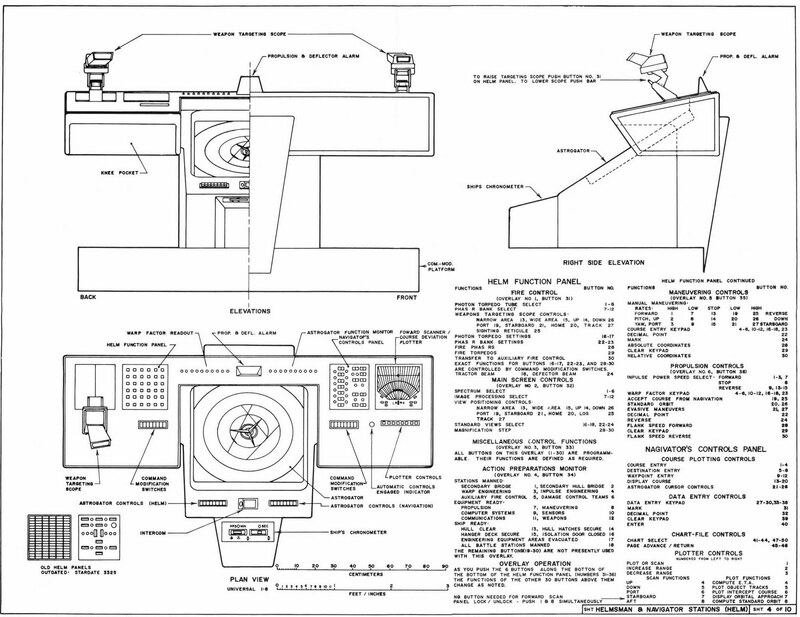 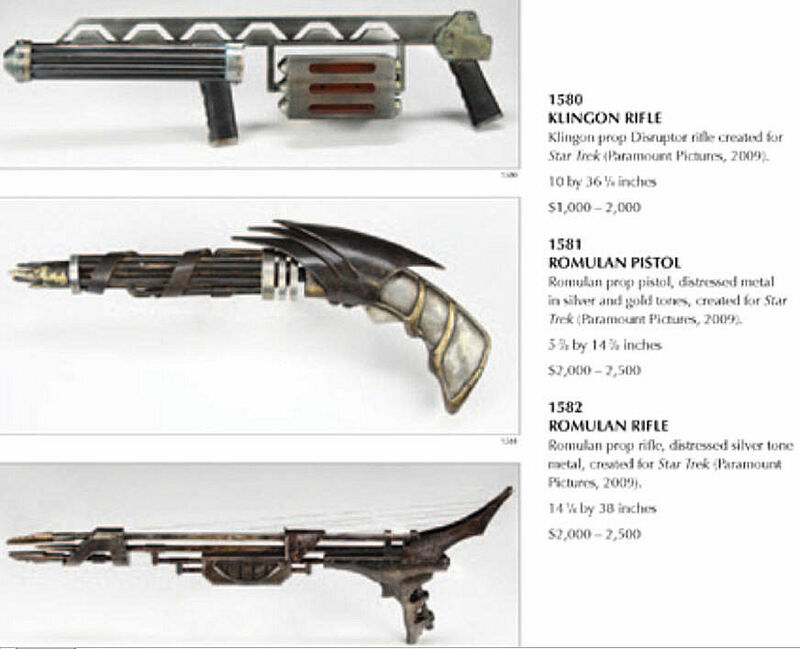 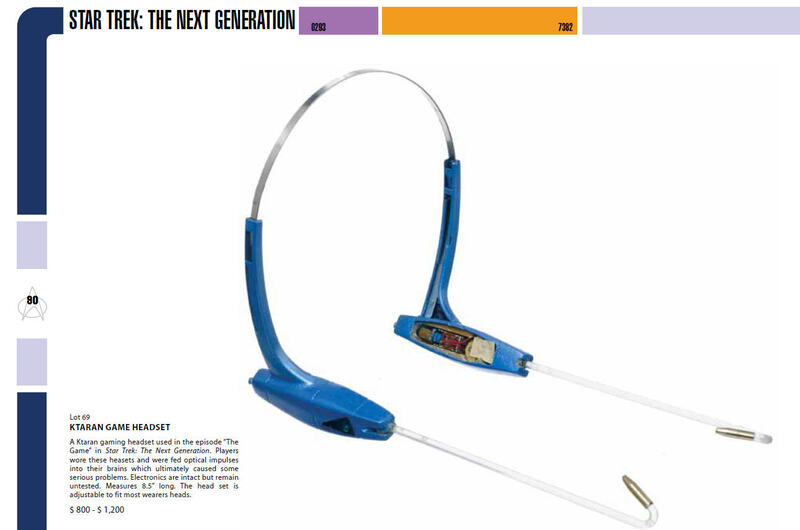 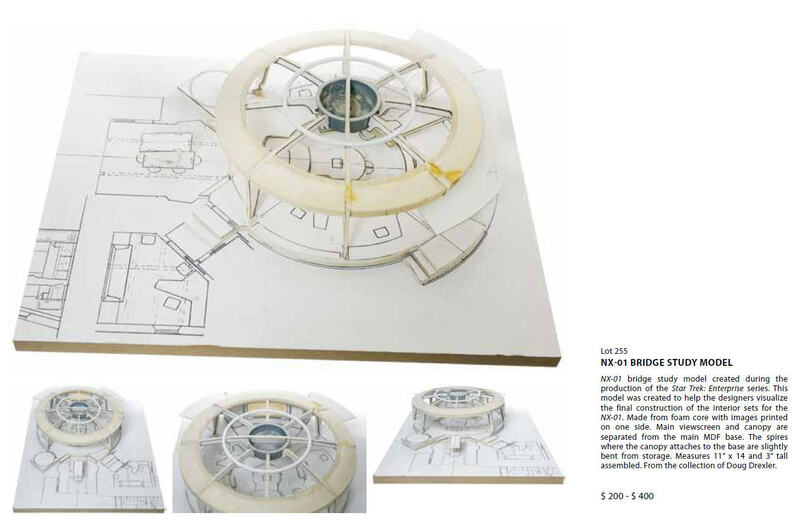 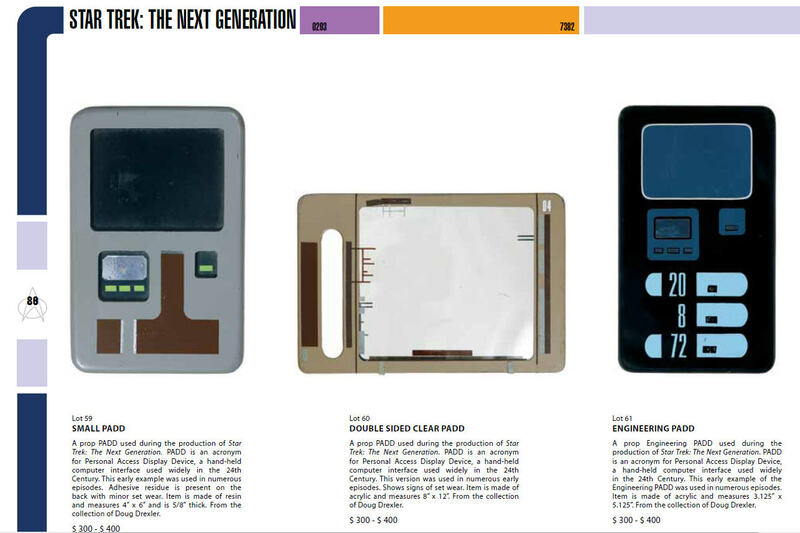 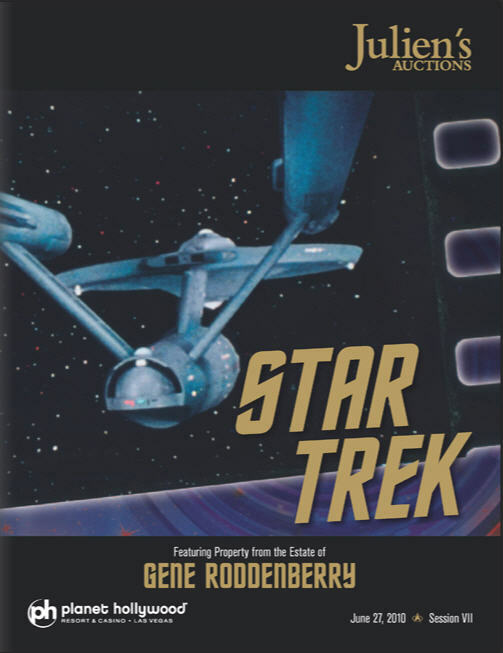 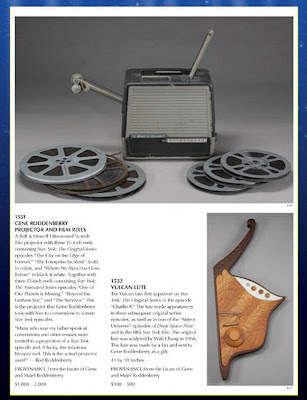 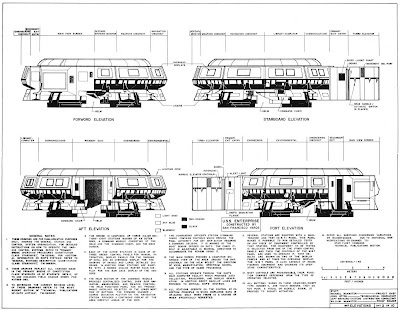 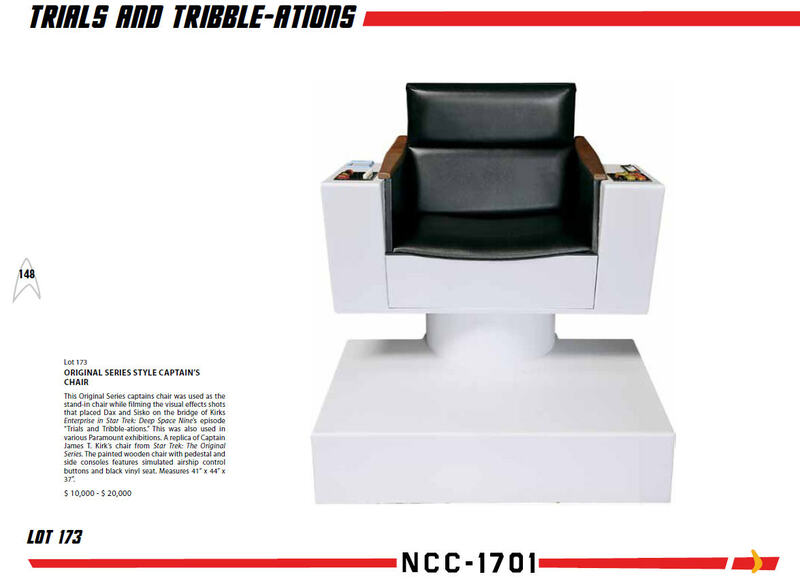 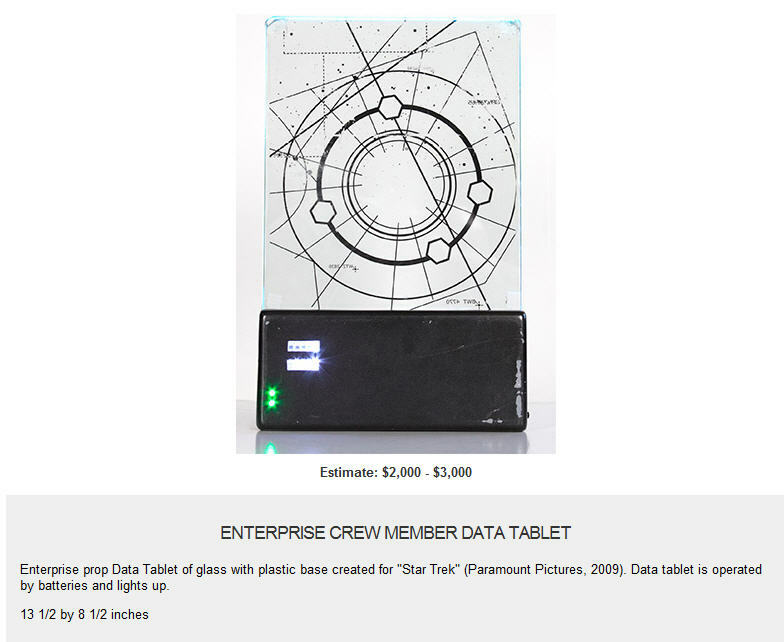 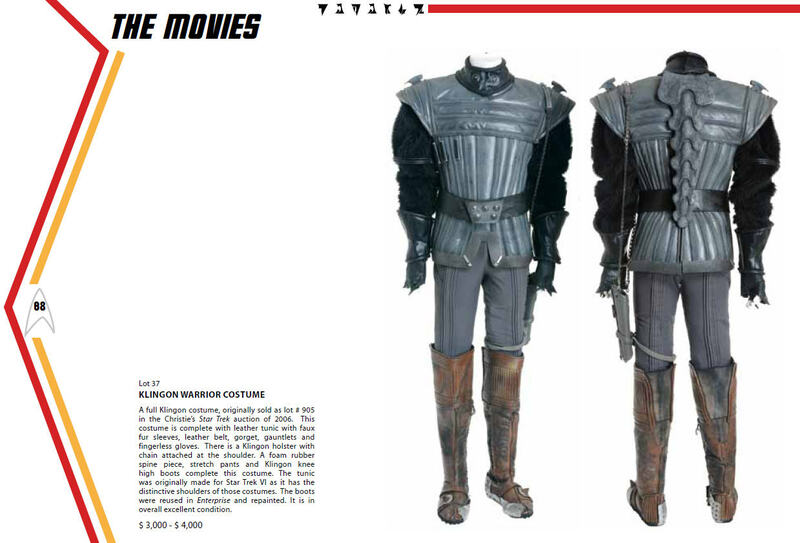 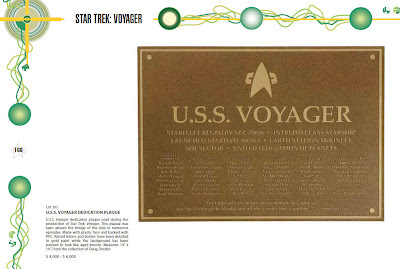 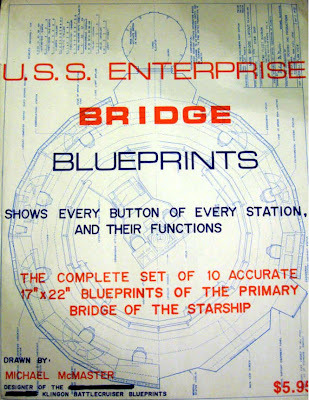 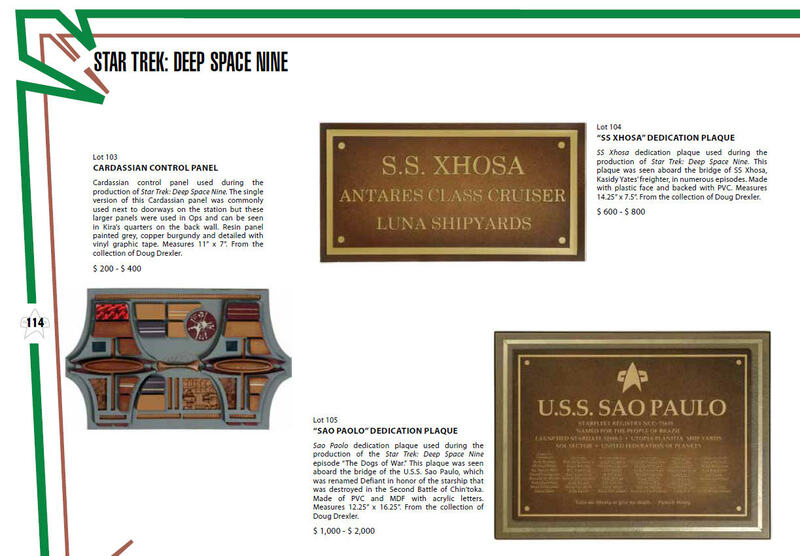 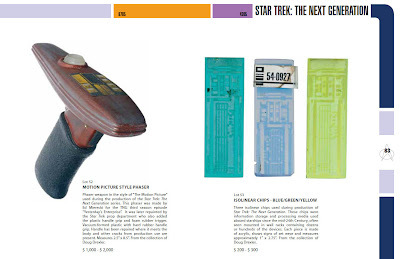 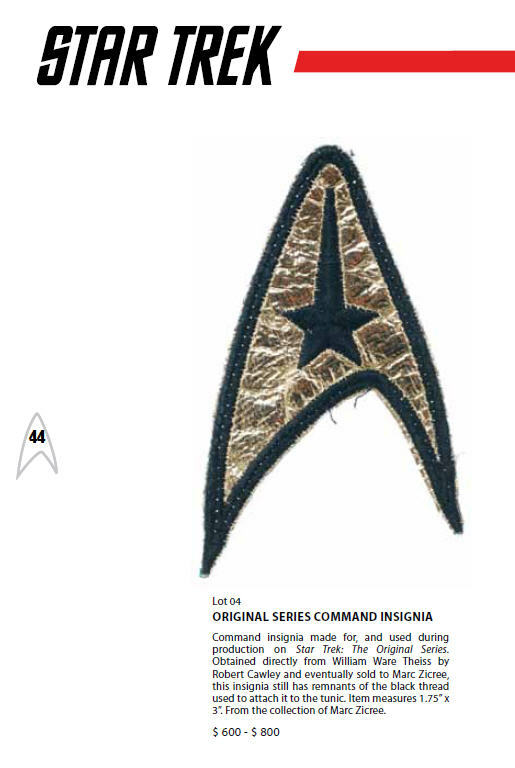 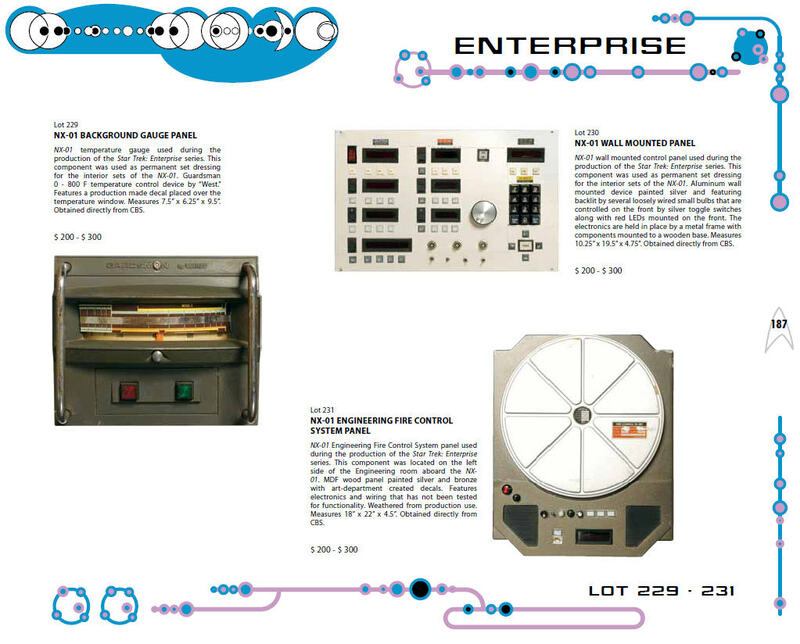 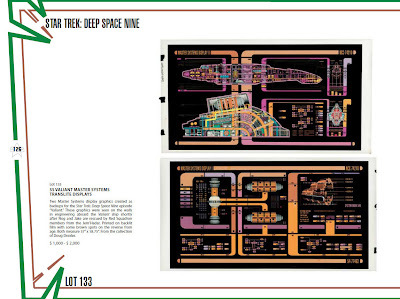 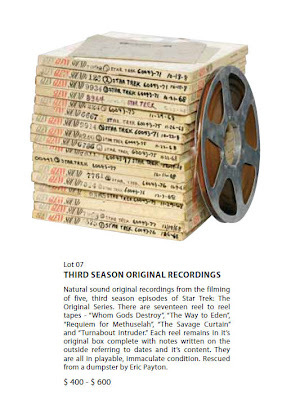 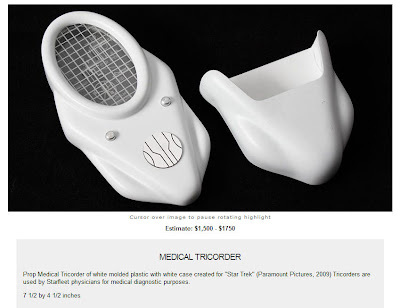 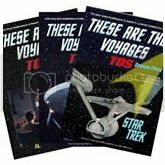 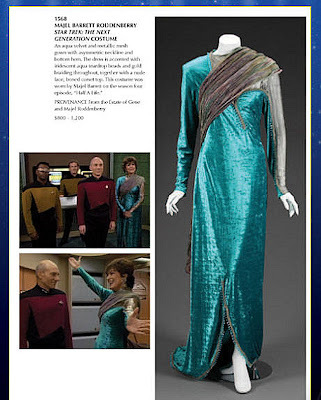 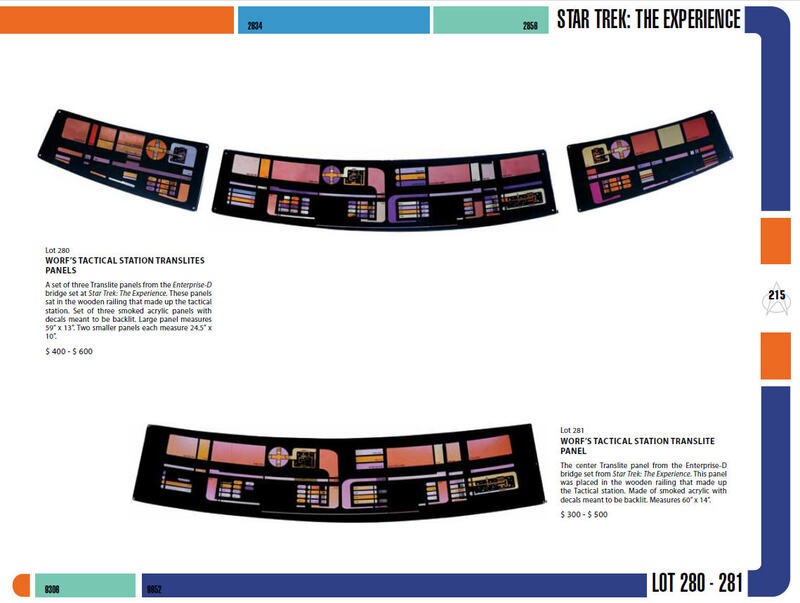 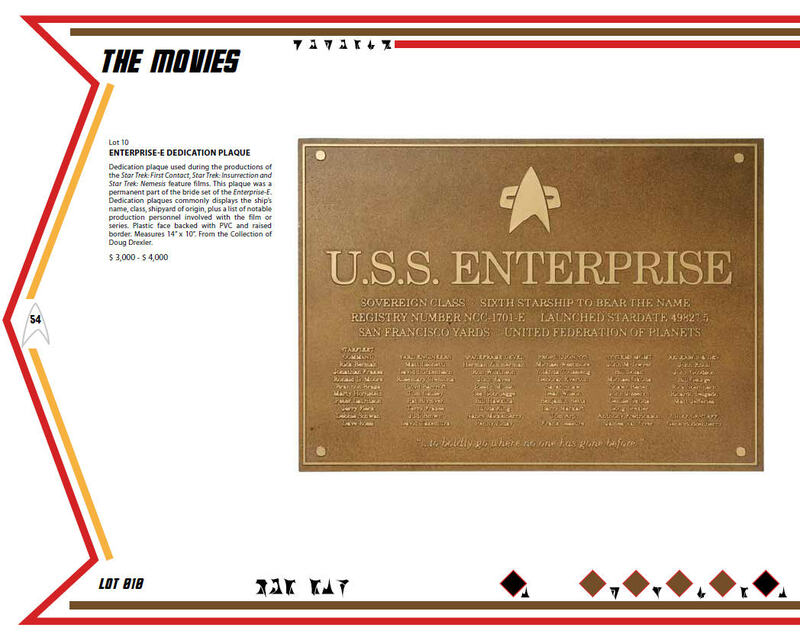 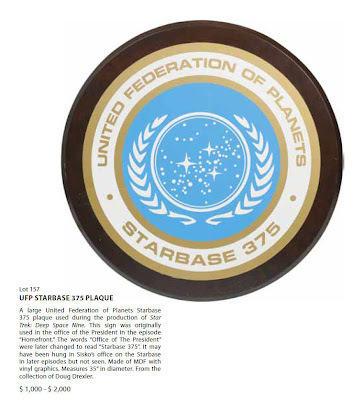 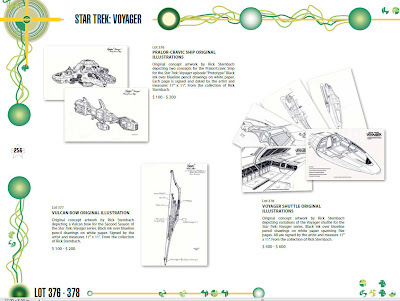 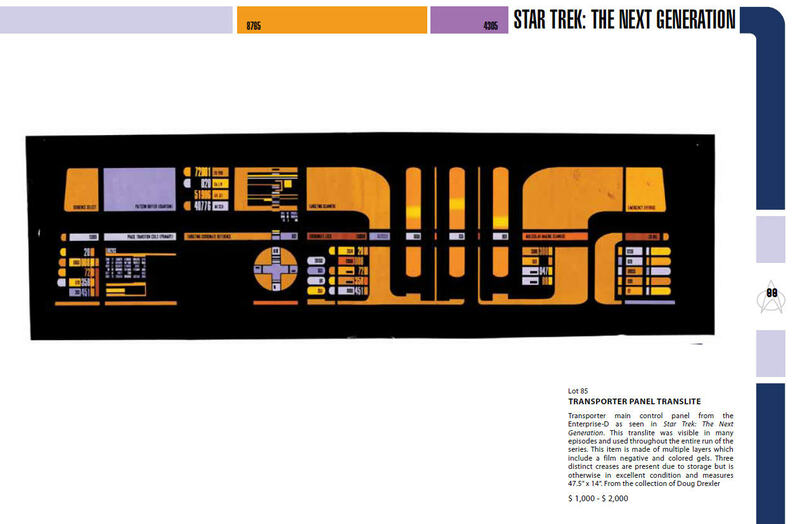 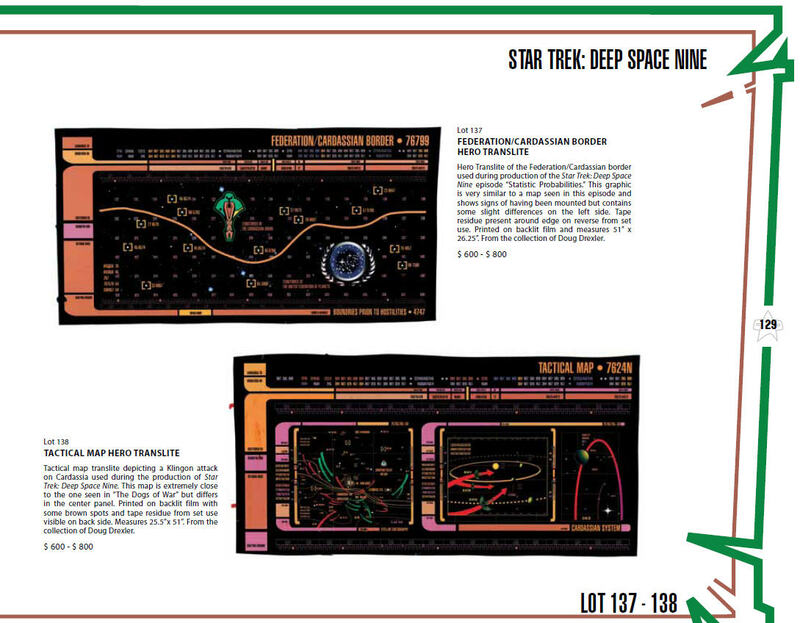 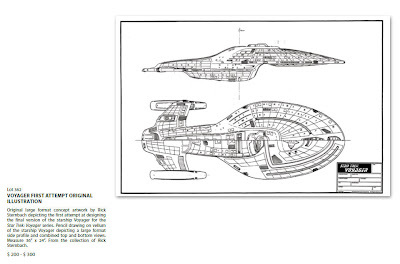 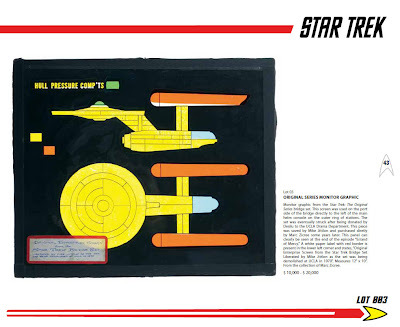 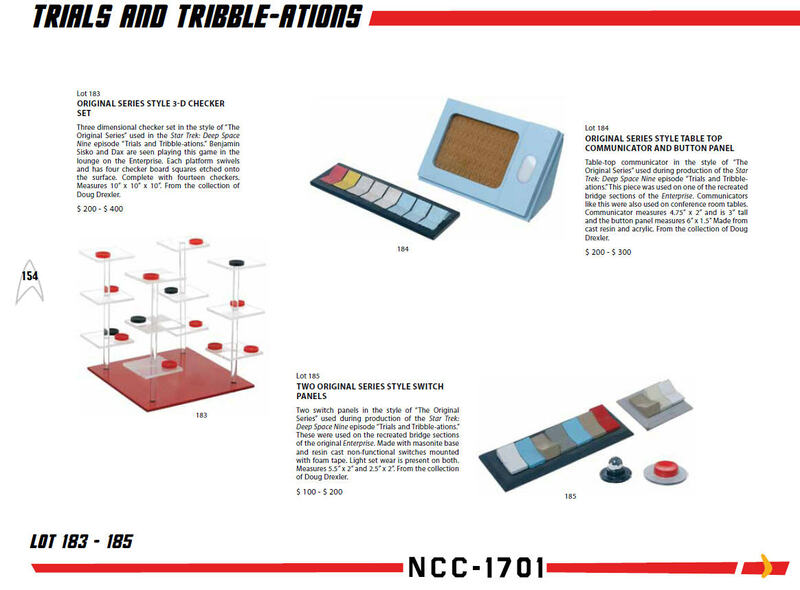 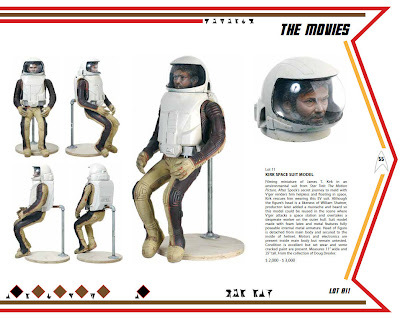 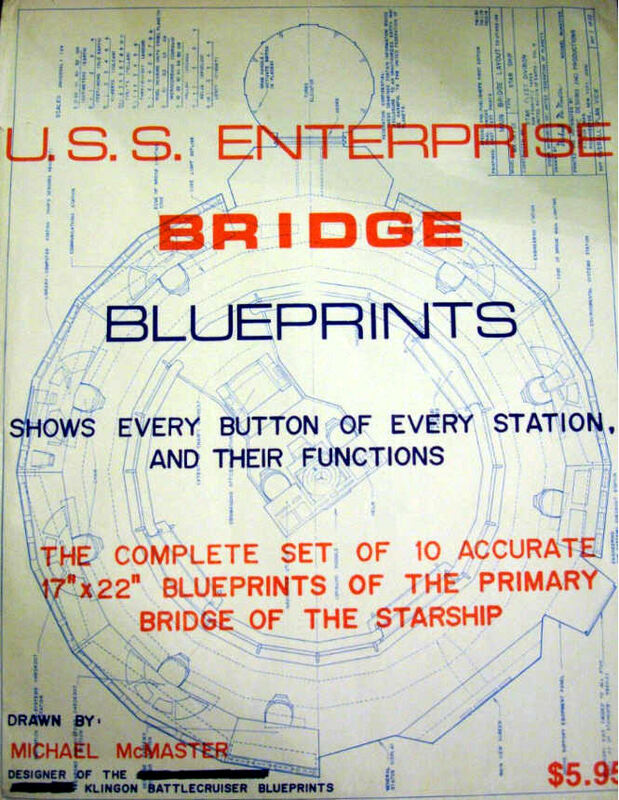 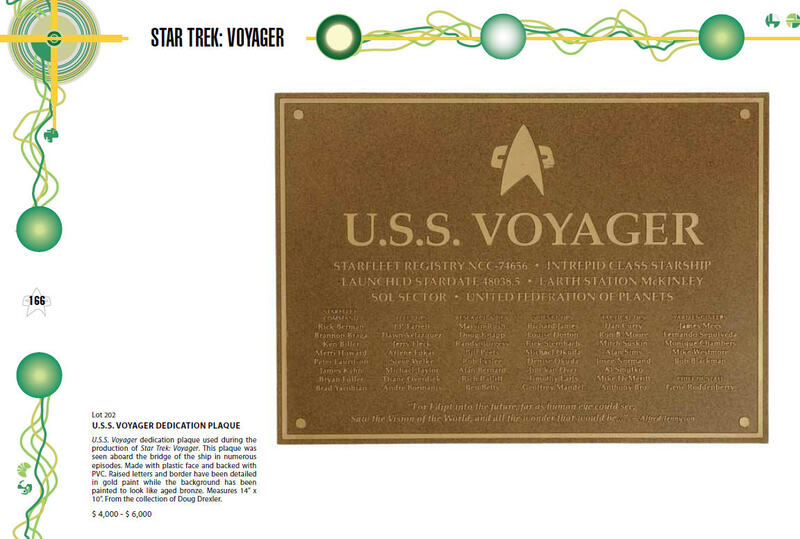 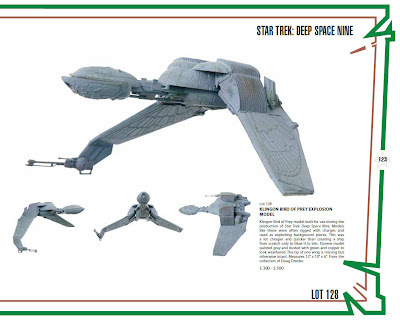 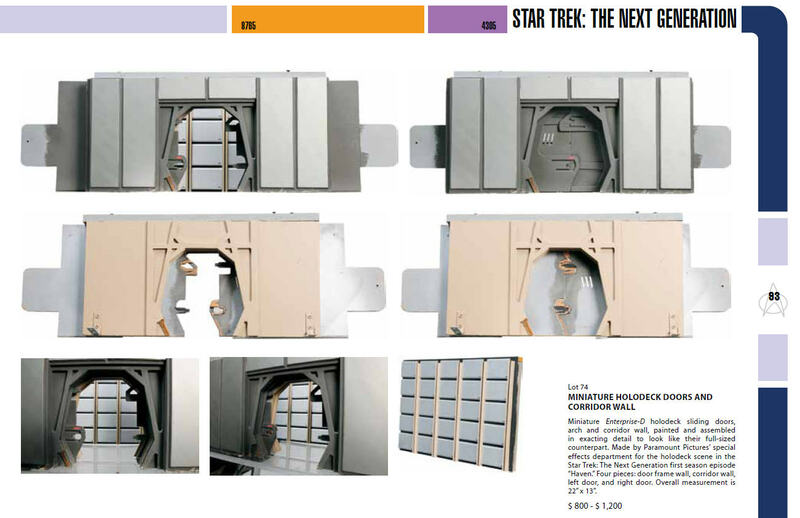 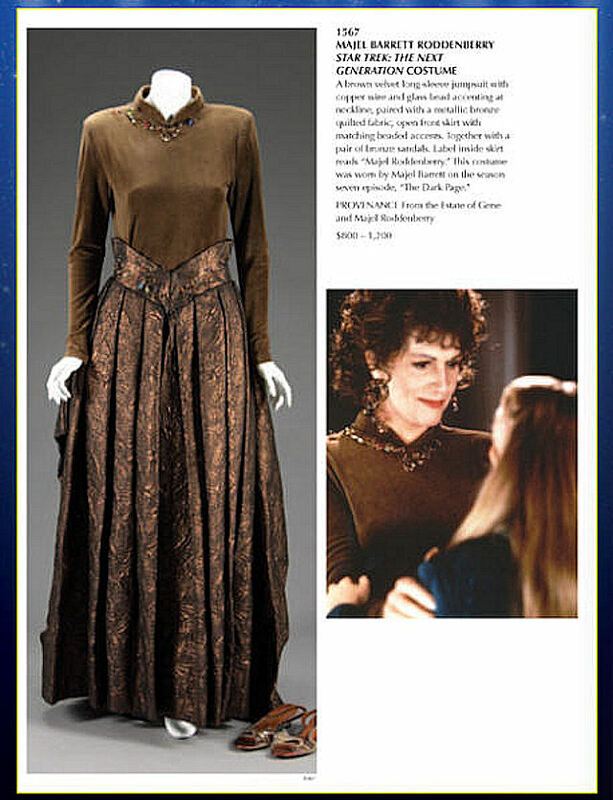 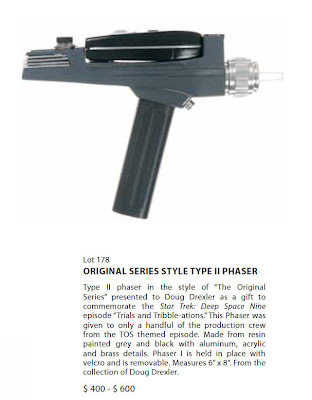 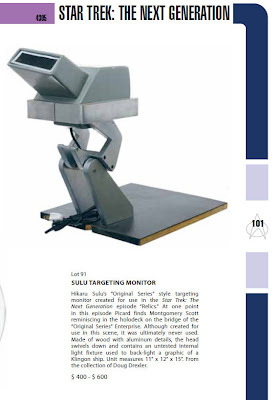 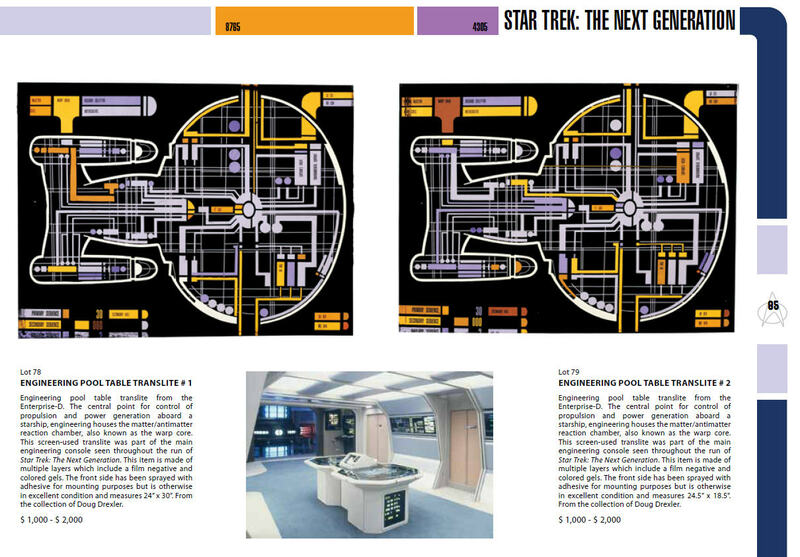 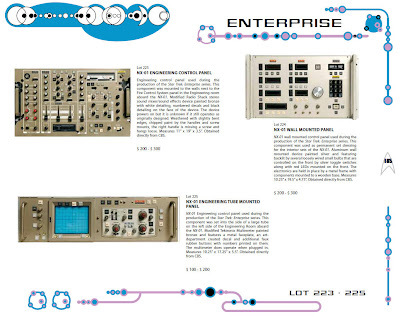 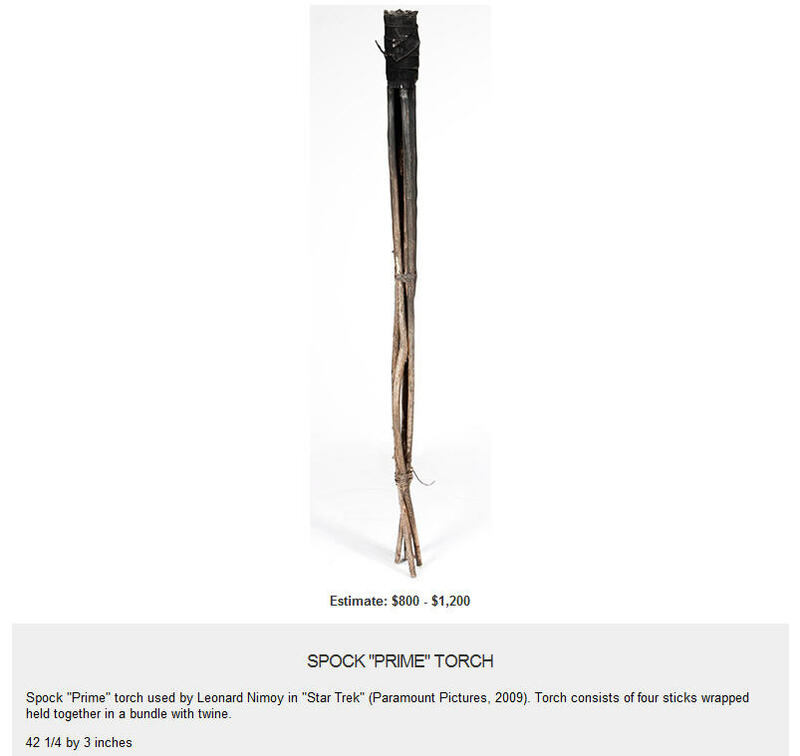 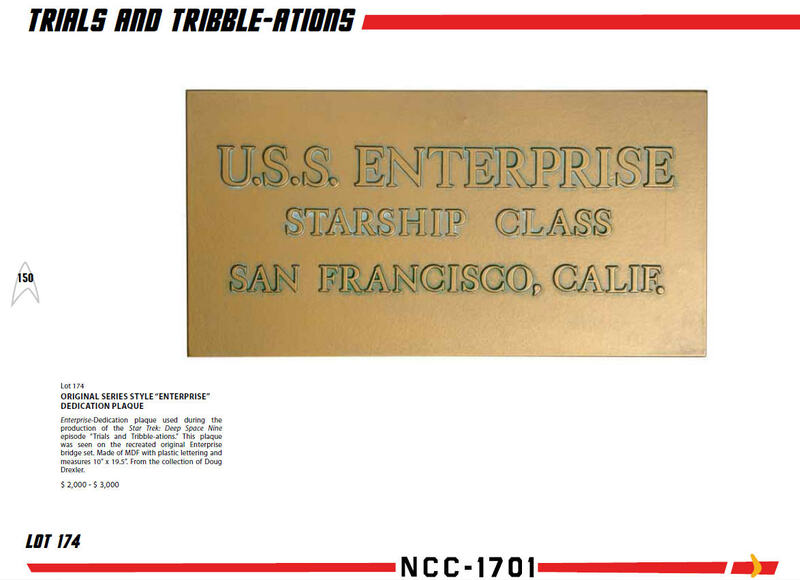 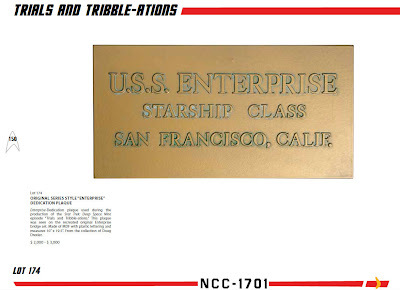 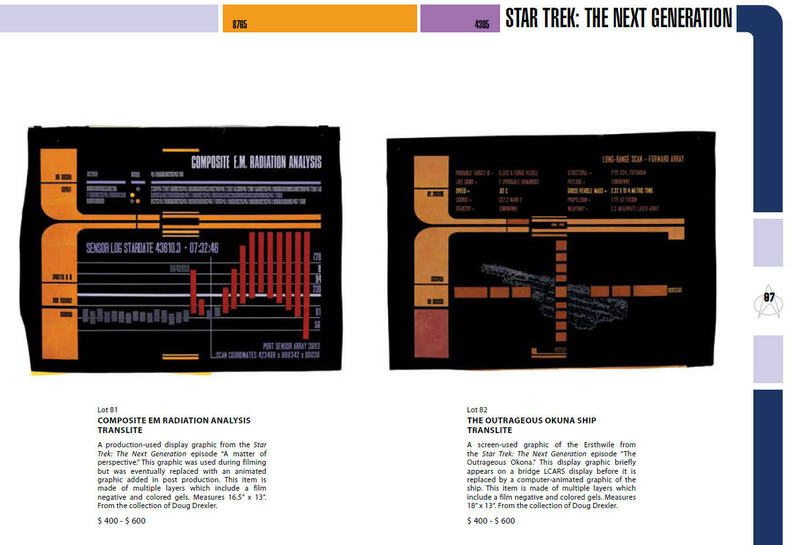 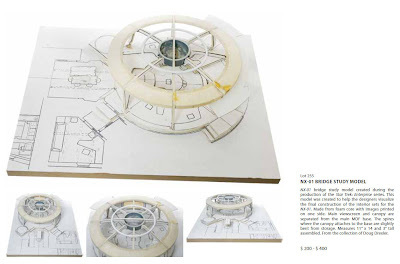 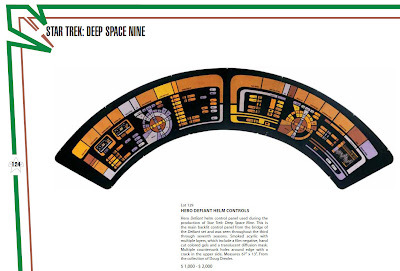 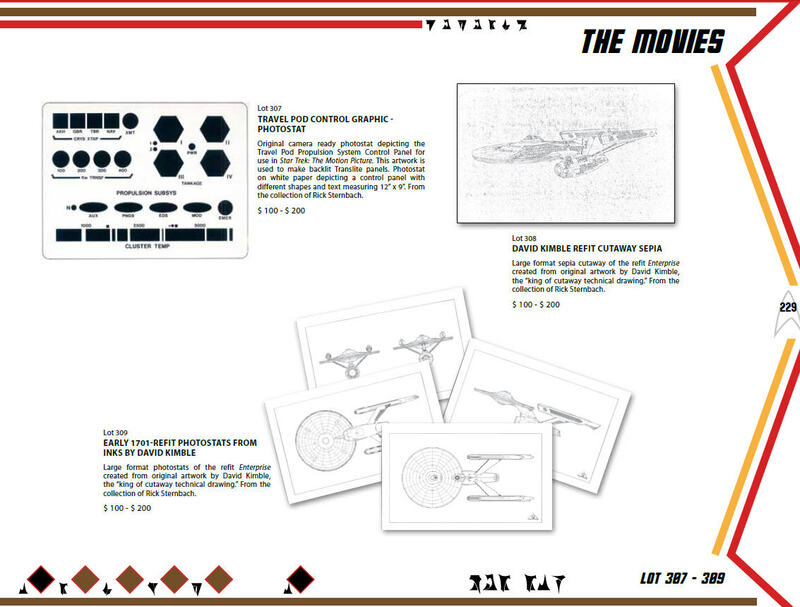 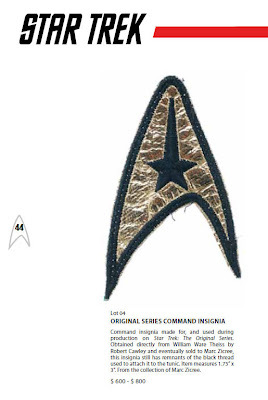 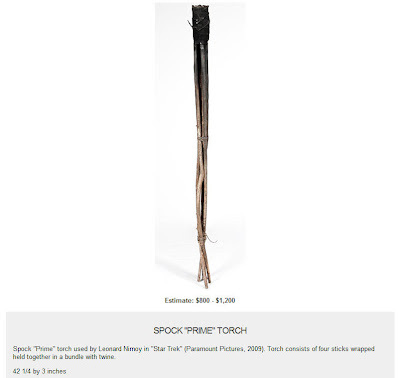 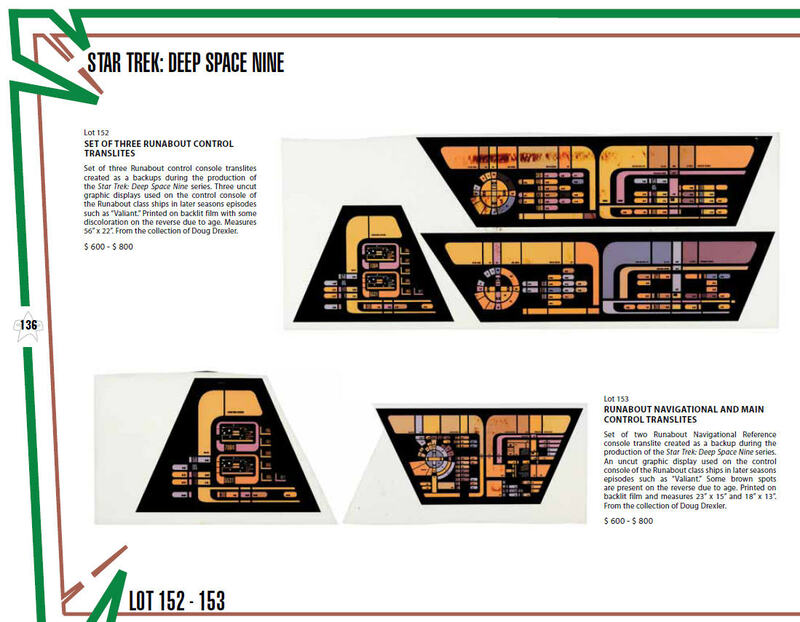 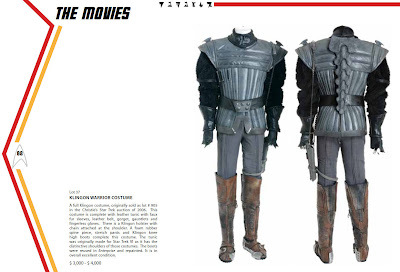 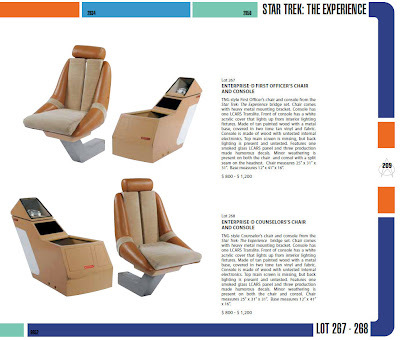 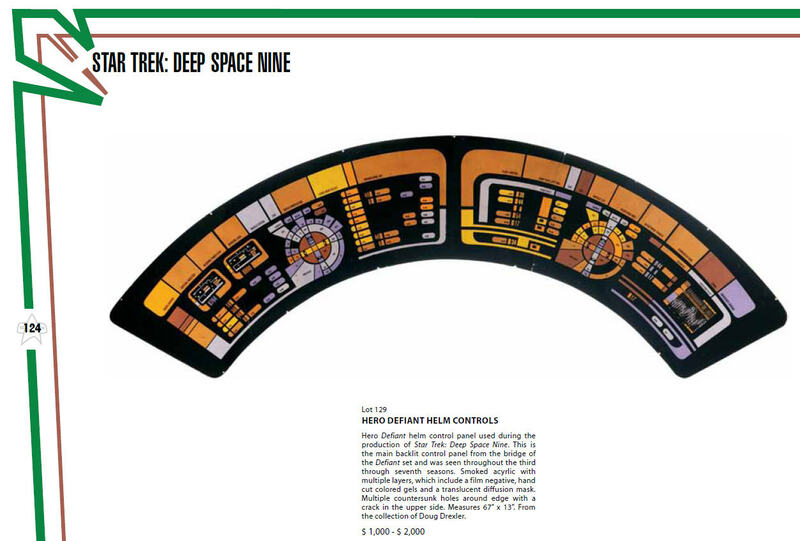 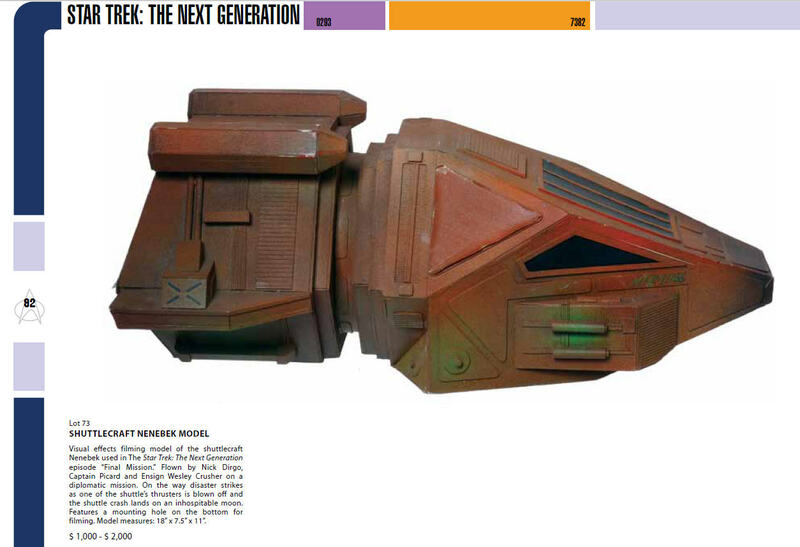 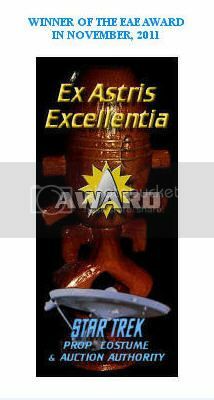 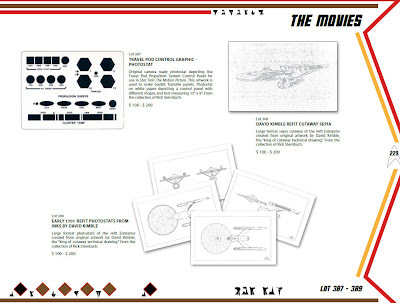 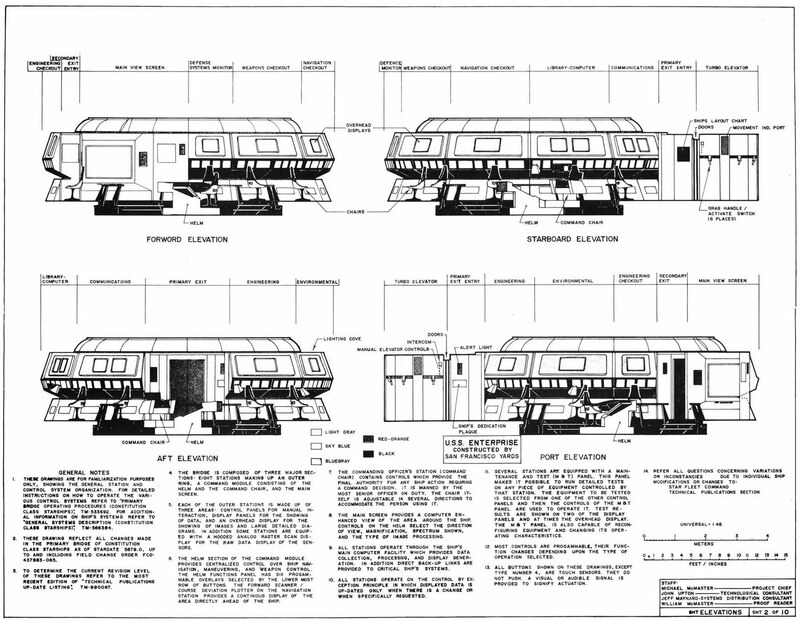 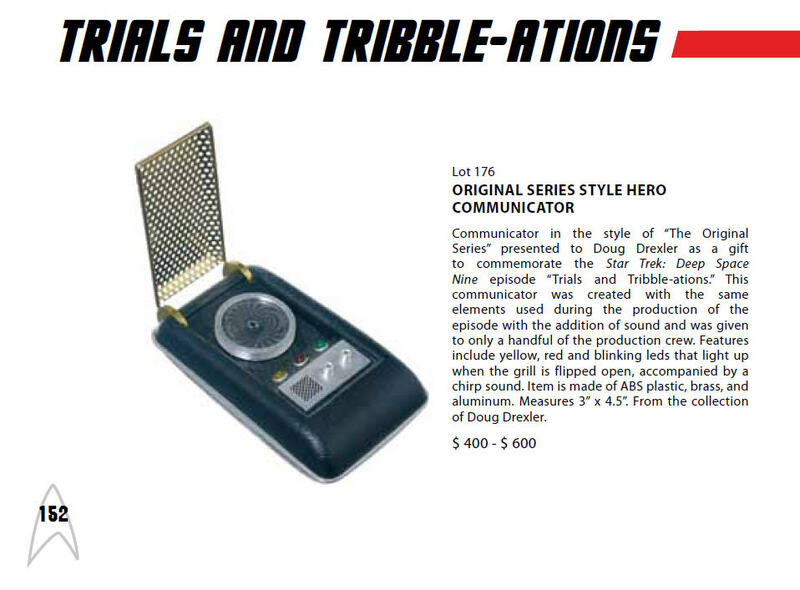 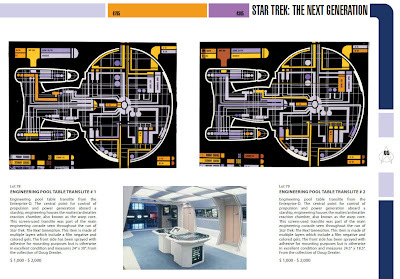 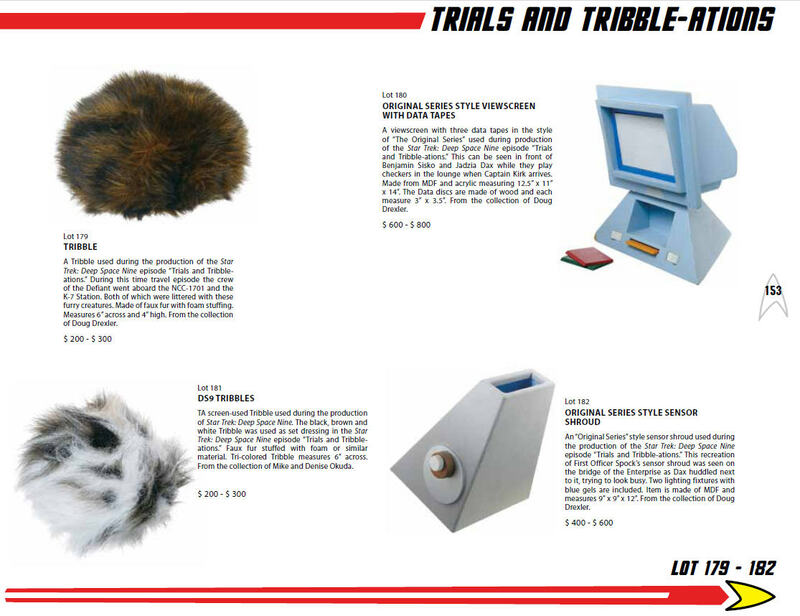 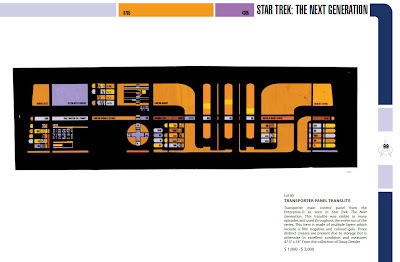 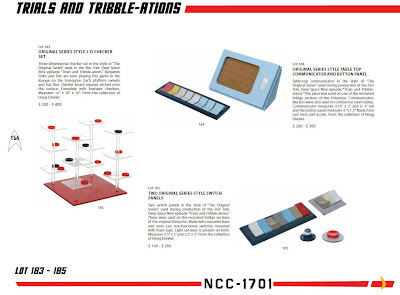 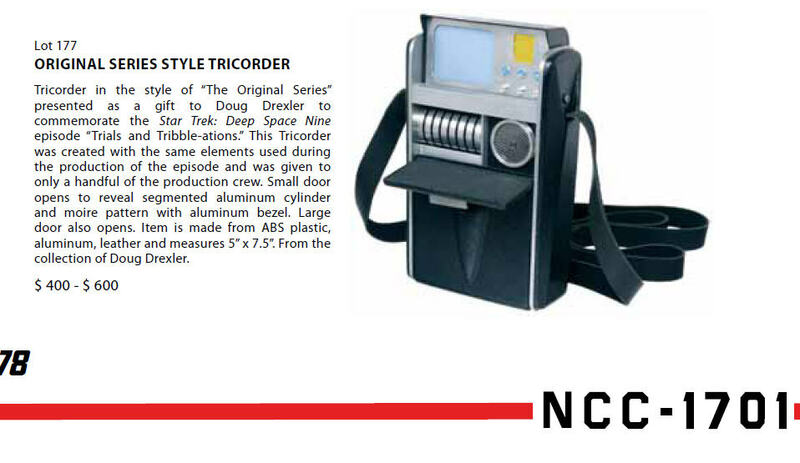 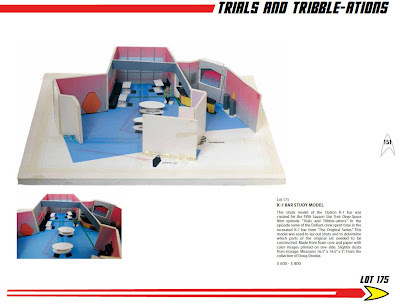 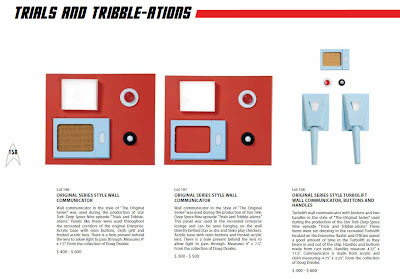 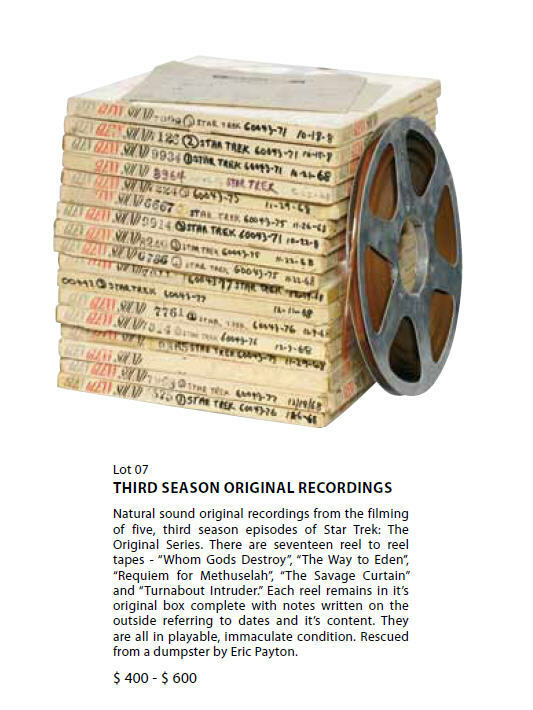 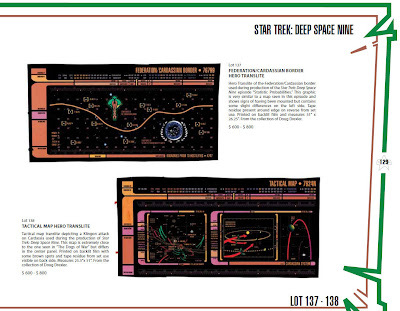 It is available as a free download at the following link: http://www.propworx.com/star-trek-auction-catalog/; however, readers should very strongly consider ordering a printed version which would truly make an excellent addition to any Star Trek memorabilia reference library. Propworx conducted a highly successful warehouse sale of assets from Star Trek: The Experience last month in Las Vegas, Nevada which garnered world-wide press attention and have followed up that effort with the creation of this ... masterpiece! 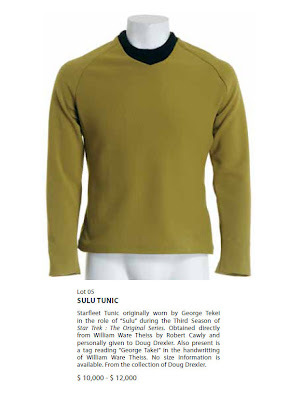 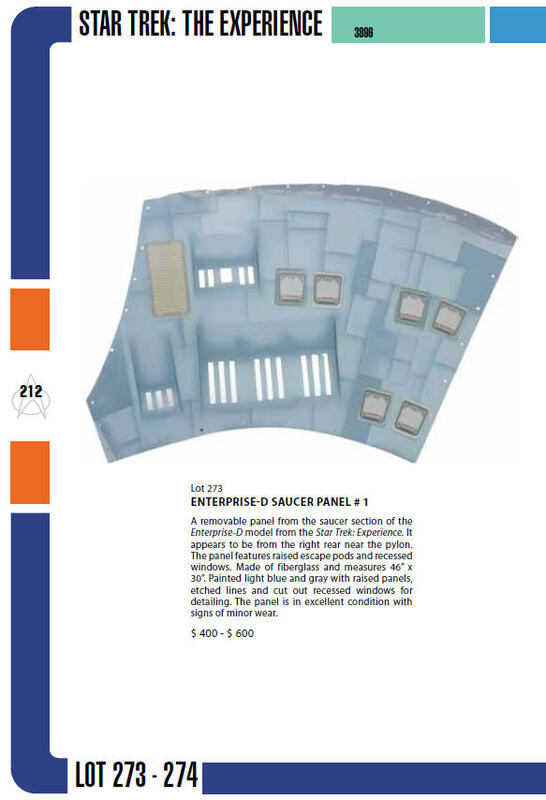 Not only are there very historic and iconic offerings from Star Trek: The Original Series available in this sale (including items such as a set of rare TOS Spock Ears, a TOS Sulu 3rd season command tunic, and an incredibly rare original TOS Bridge set Monitor graphic - these panels almost never appear at auction! 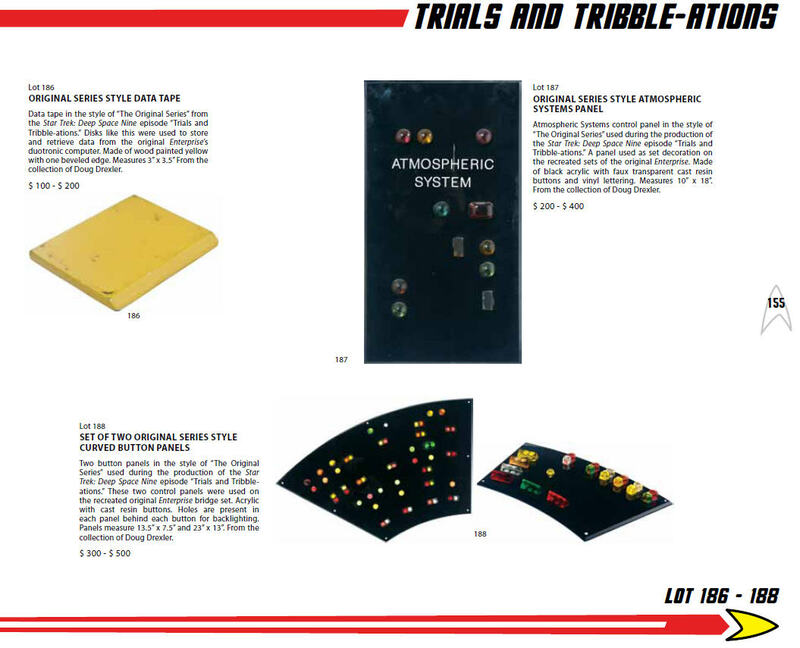 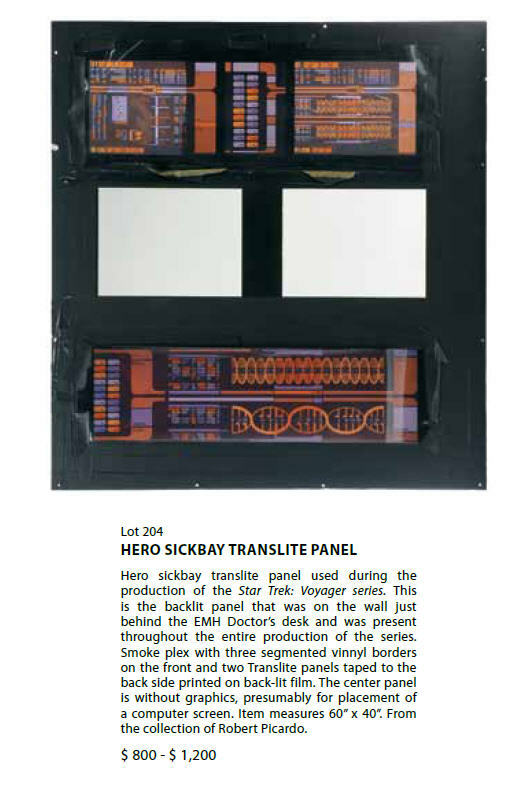 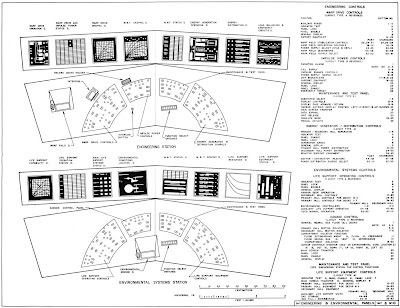 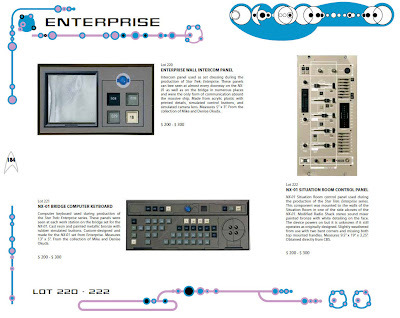 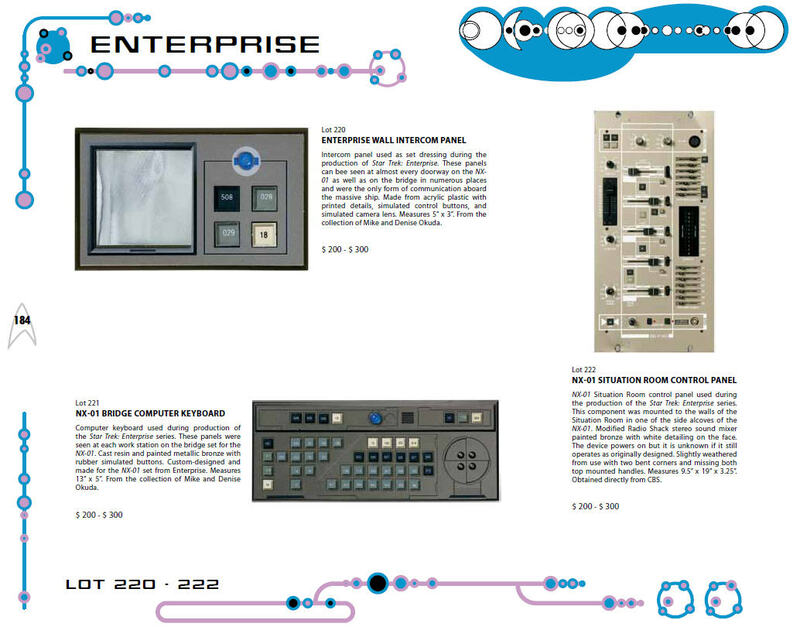 ), but Propworx has also assembled an amazing array of beautiful LCARS panel translites from Star Trek: TNG and later series; a stunning collection of elaborate Star Trek: Enterprise control panels; and a large offering of highly desirable TOS-style props and fixtures from the special Deep Space 9 tribute episode "Trials and Tribble-ations" - produced to honor the 30th anniversary of The Original Series. The Original Series style Captain's Chair that was used in the episode is part of this group. 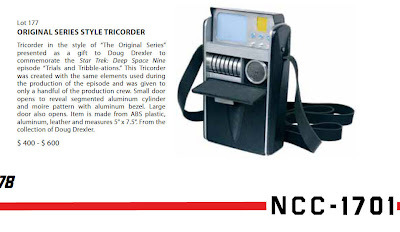 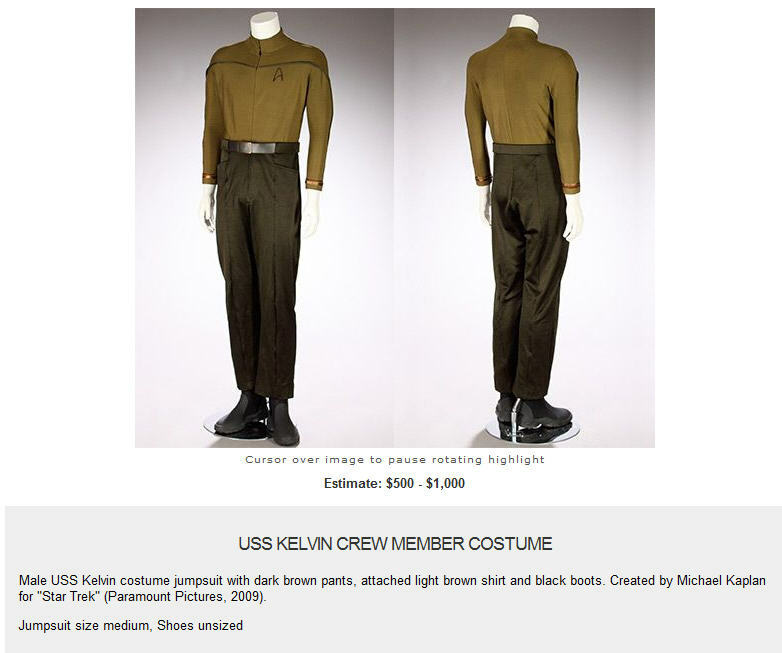 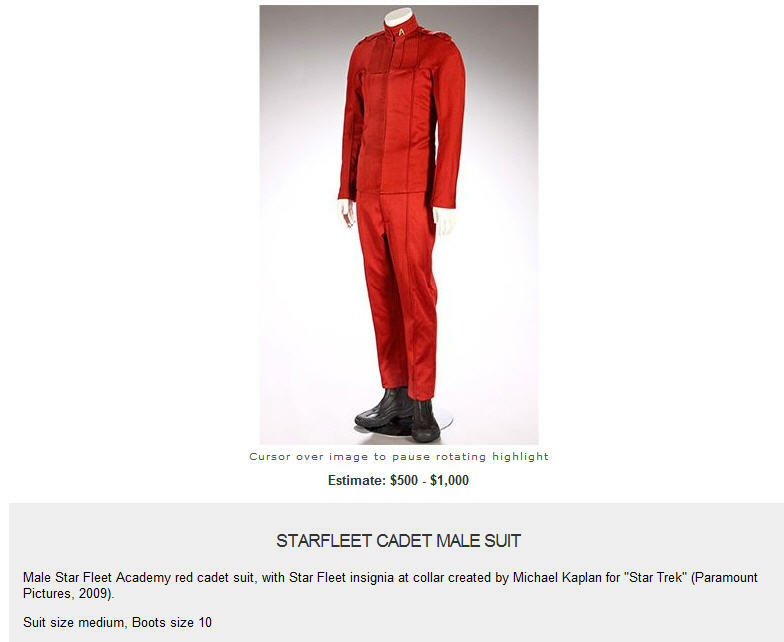 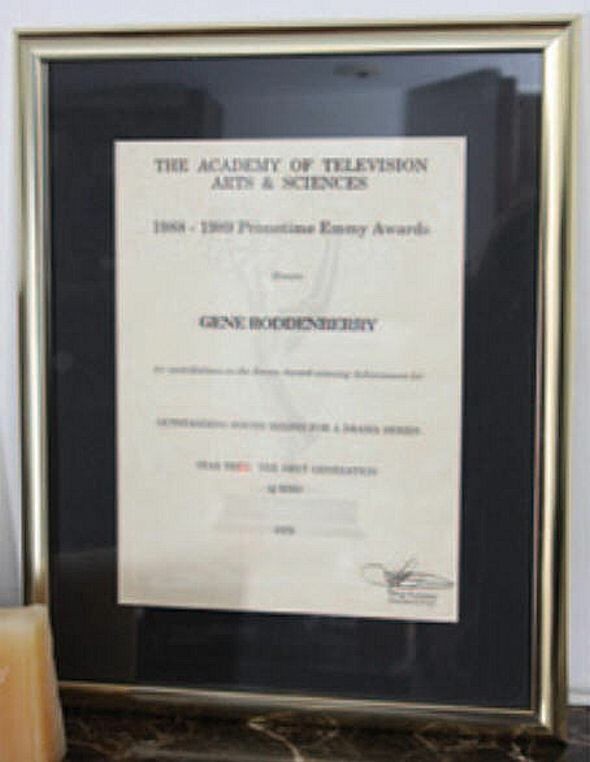 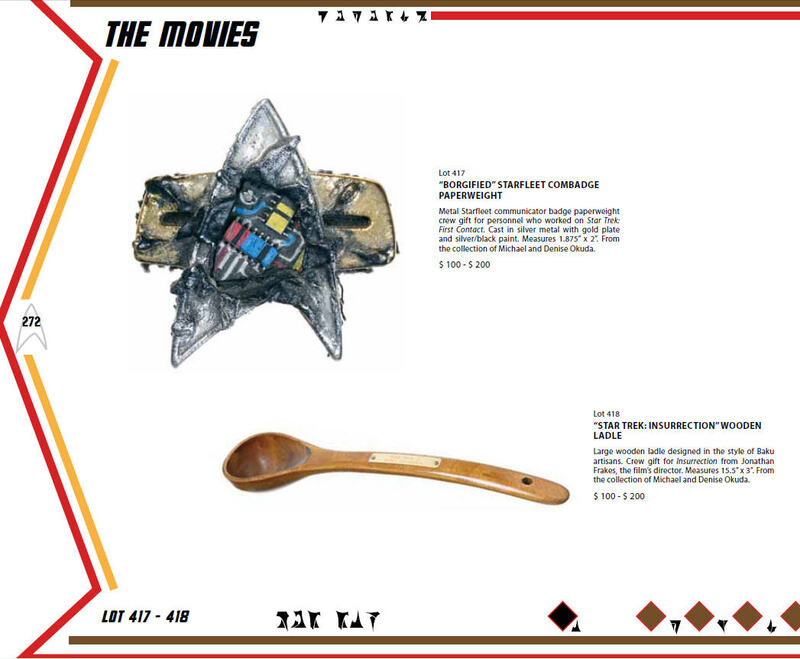 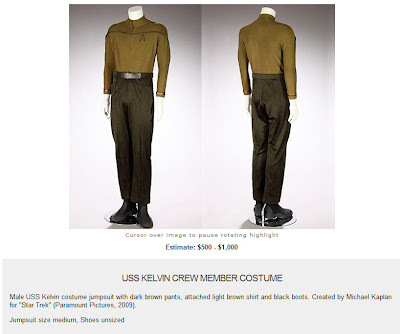 Many of these screen used items come with impeccable provenance directly from the collection of Star Trek visual effects artist and illustrator Doug Drexler; the collection of the legendary Star Trek graphics designer/visual effects producer team of Mike and Denise Okuda, and from CBS directly. 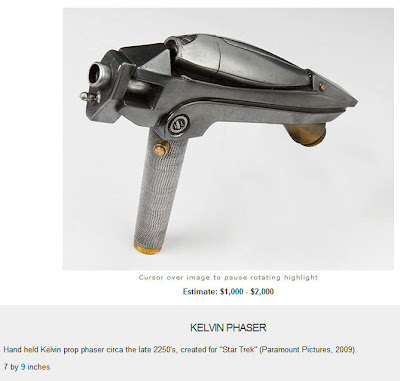 (This sale is the only auction this summer officially sanctioned by CBS/Paramount.) 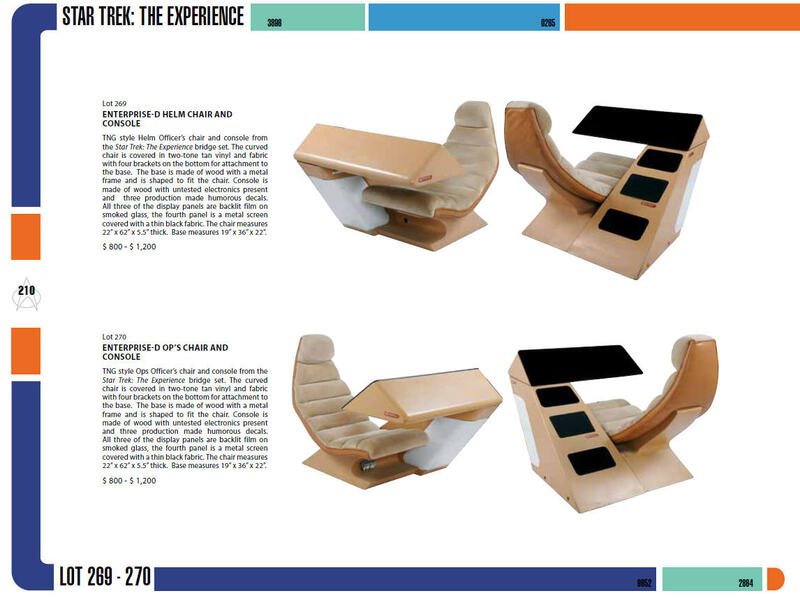 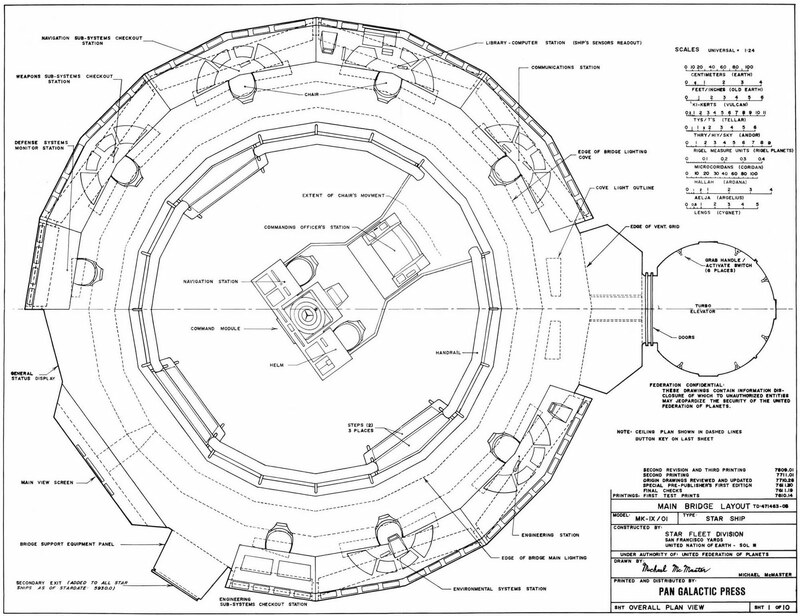 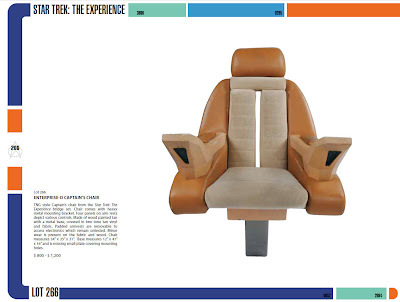 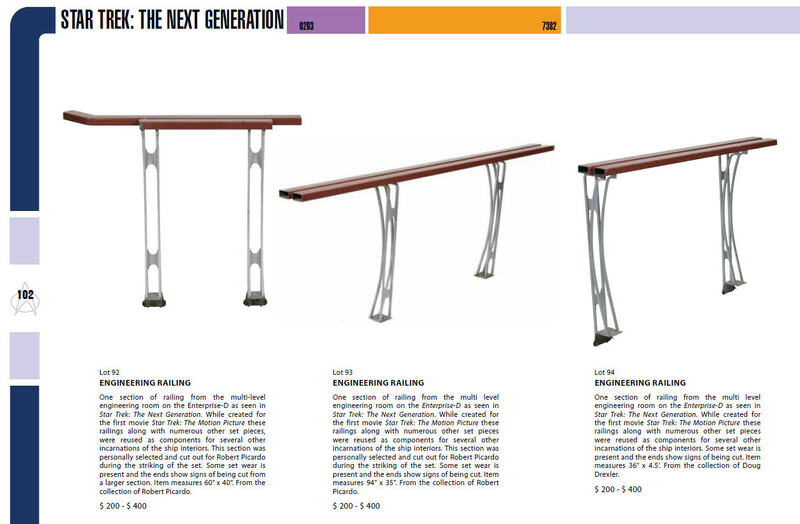 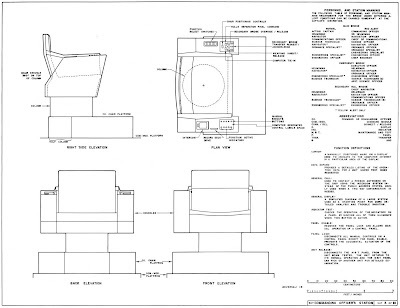 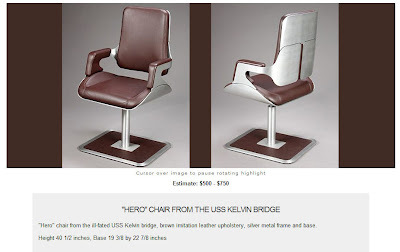 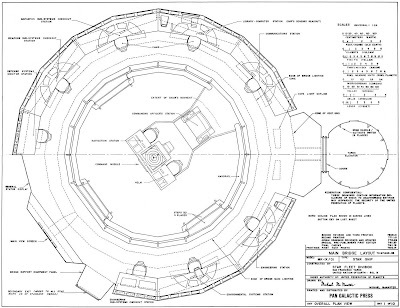 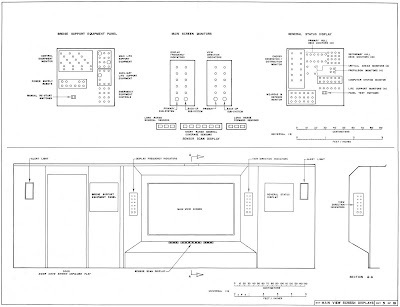 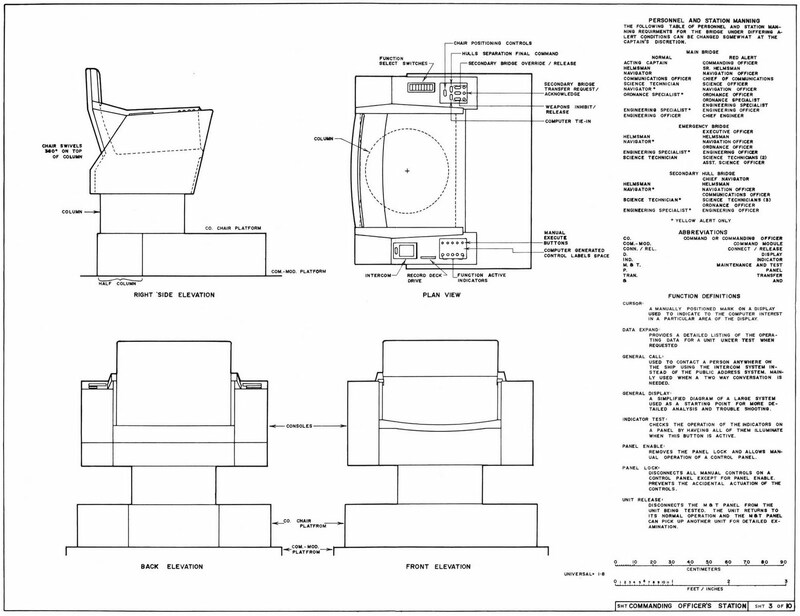 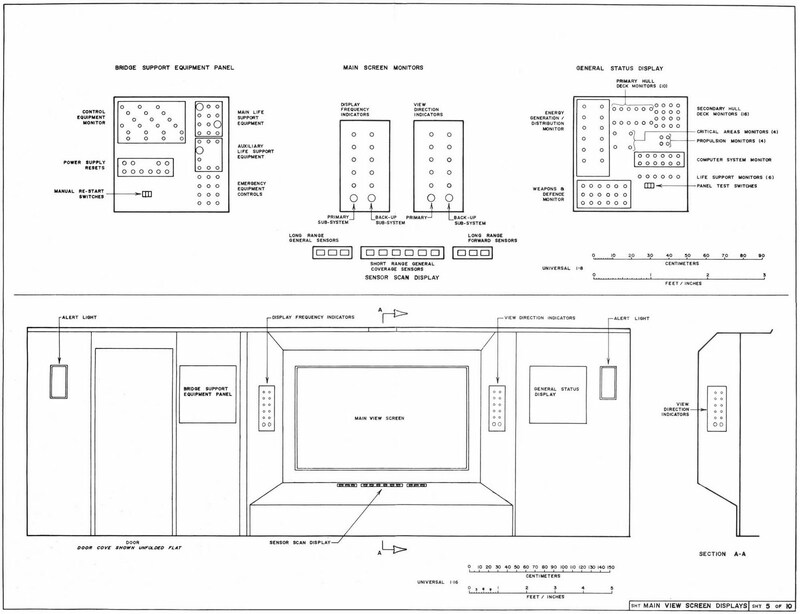 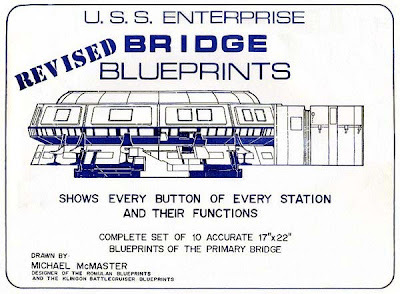 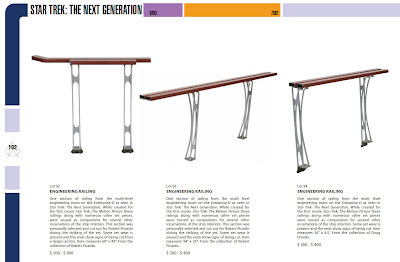 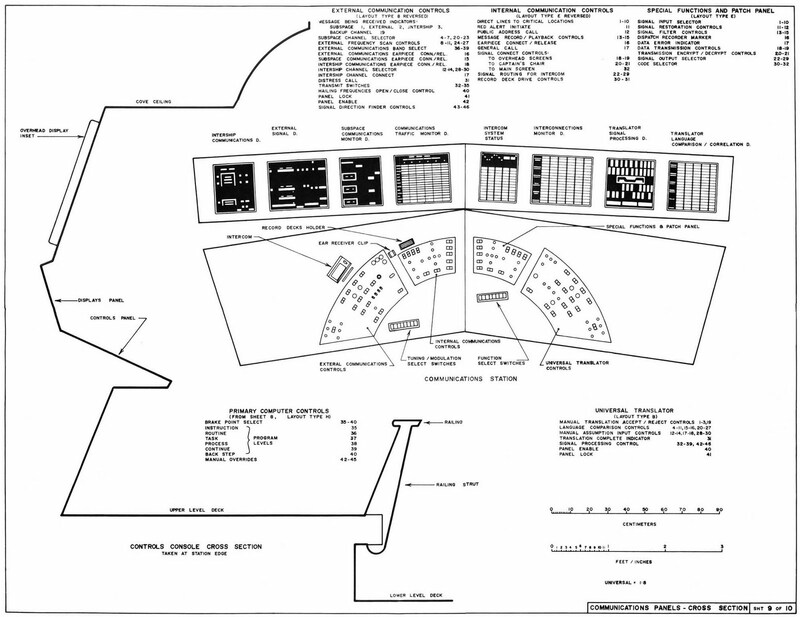 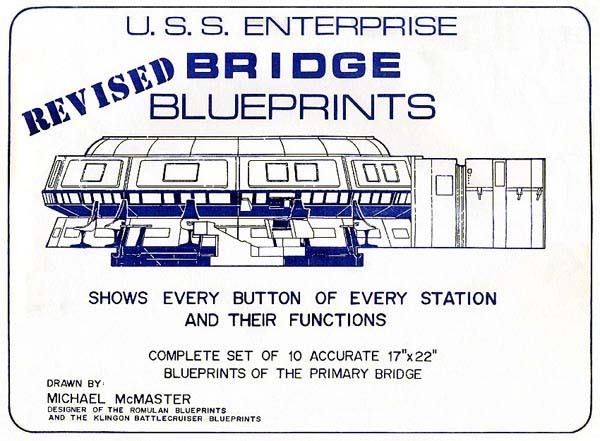 There is also a splendid offering of Galaxy Class Bridge furniture from the historic Star Trek: The Experience attraction; and a special auction session of original concept art directly from the collection of Star Trek Senior Illustrator Rick Sternbach, filled with dozens of beautiful design works. 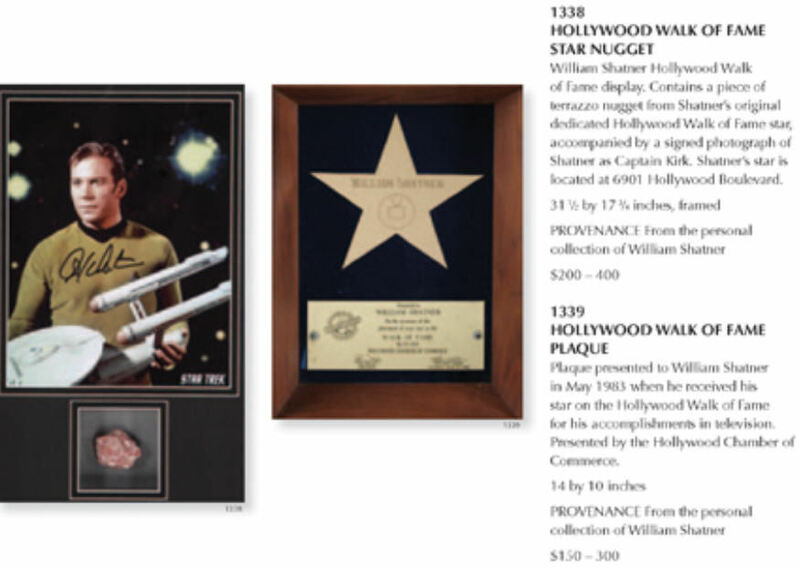 In total, 450 lots of impressive memorabilia will be up for grabs this August. 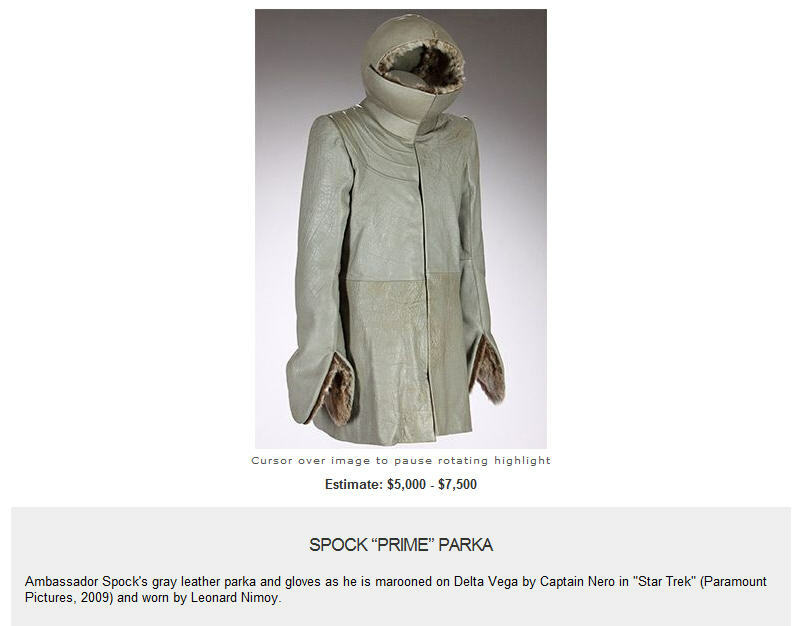 This auction truly has it all! 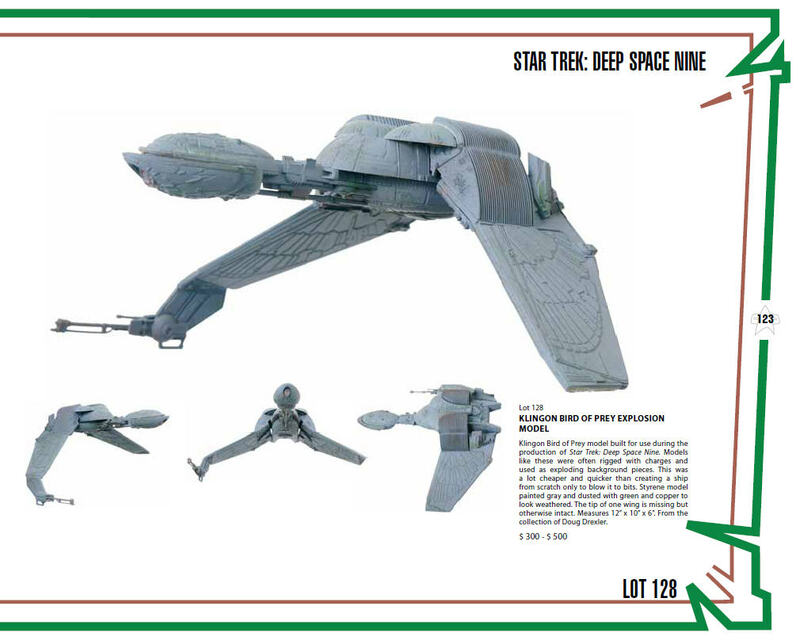 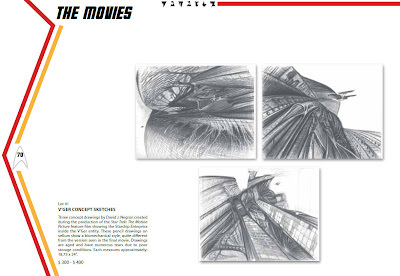 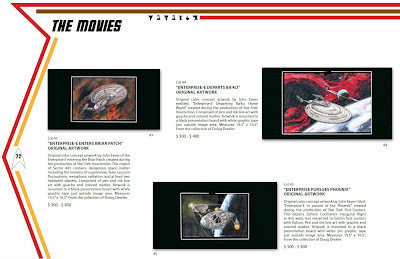 - including some exciting starship special effects and prototype models that I believe could draw some very high bids! 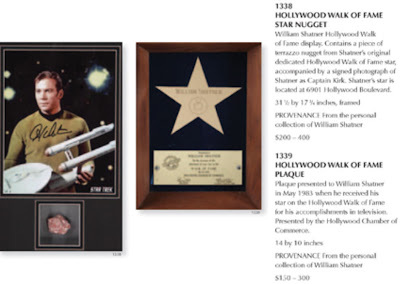 Collectors who plan to attend and bid in this historic auction in person may Register at the event, starting at 9:00 am on August 8th, 2010 at the Las Vegas Hilton, 3000 S. Paradise Rd., Las Vegas, NV 89109. Online bidding is also enabled and online bidders may register through the Propworx.com website.